3/29/18 I'm releasing a huge Library of Video, These were recorded in 2011, but I've only release for staff training, until now! Pizza is the most sensuous of foods. 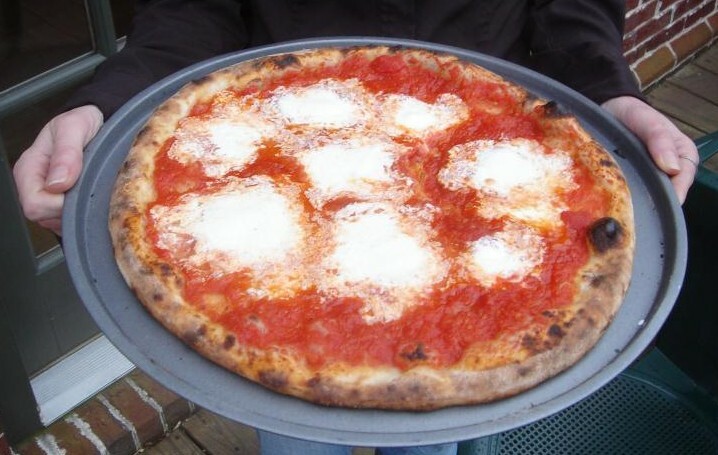 I get emails from around the world and one of the most common goes something like this: "Jeff, I had this one perfect pizza at a corner shop in Brooklyn in 1972 and I've been thinking about it ever since." I love that!. That's passion. Do you know how many forgettable meals have come and gone since then. What kind of pizza leaves a 35 year impression? Let me describe it to you. The crust is slightly charred. It has a crisp outer layer, but inside it's airy and light. The ingredients are not piled high, but instead are perfectly balanced. It's sweet, salty, full flavored but not greasy. The tomatoes burst with flavor. Each bite makes you hungrier for the next. If this is what you want, you've come to the right place. This pizza is modeled after Patsy's on 117th street in NYC. I have been working on this for SIX years, but FINALLY I can report that I have achieved my goal. Many people have tried my pie and swear it is not only the best pizza they've ever had, but a clone of the original Patsy's recipe. This margarita pie is incredibly light and perfectly charred. It took just 2 minutes and 10 seconds to bake at 825F. Reproducing this was no easy feat, but since moving to Atlanta what choice did I have? Dominos? It's been a bit of an obsession. I've had a lot of failed experiments. However now I can honestly say that the recipe is fully accurate and reproducible. The final breakthrough came in Jan 2005 when I finally got a handle on the proper mixing equipment and procedure. But do not think that following this will be easy. It's not. It will still take practice. Many others have confirmed that by following these steps they too have come to near perfection. 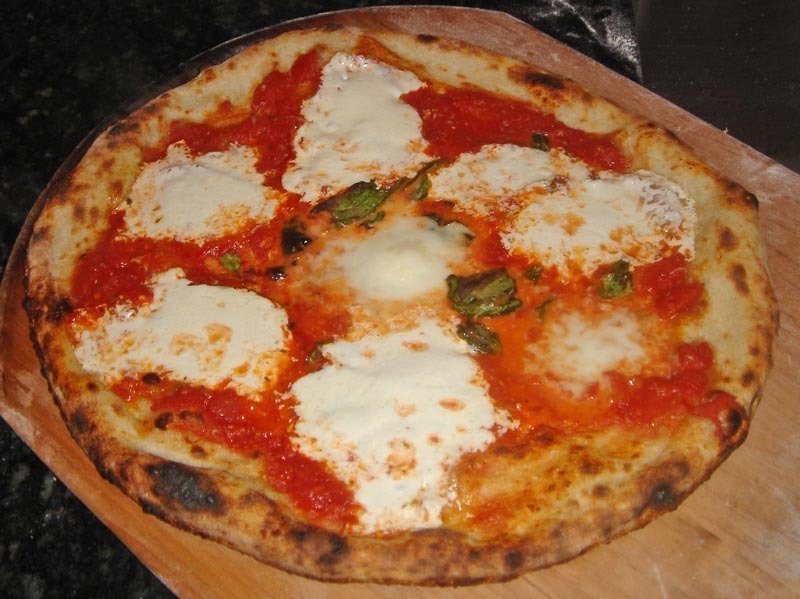 This may be the most detailed, accurate and complete recipe on the net for making a true Pizza Napoletana. Pizza inspires passion. I've gotten about a thousand emails representing every continent. If you'd like to contact me, feel free to write at Jeff@Varasanos.com. It may take a little time for me to respond, but I try to answer all emails personally. I'm going to start a photo gallery, so if you have some success, send me a photo and I'll add it for others to see! 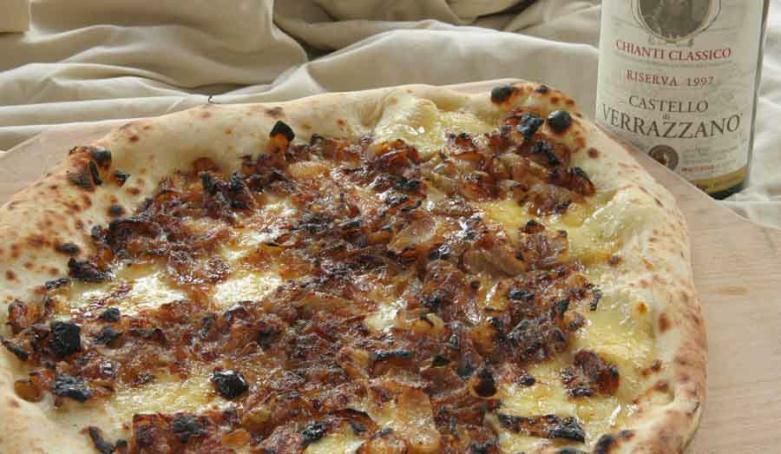 At the bottom of this page, I have a List of the Best Pizzerias in the World which I've also places on this Google Map of The World's Best Pizzas. In addition I've created a second Google Map of Fan Favorites - places that have been recommended by fans of this site. I can't really vouch for these but if your in the area check them out and let me know your opinion. Me - Do I look happy or what? Check out many more photos at the bottom. Let me start off by saying a few things. First, this is about a certain style of pizza. 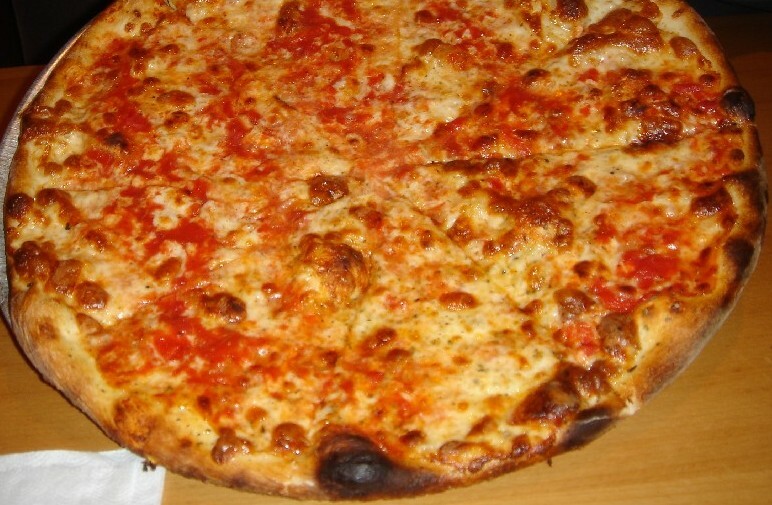 This site is about the kind of pizza that you can get at the oldest and best places in the U.S. or in Naples. This is not about Chicago style or California Style or trying to reproduce Papa John's garlic sauce... This is about making a pie that's as close to Patsy's or Luzzo's or Pepe's or some of the top Brick Oven places. Not that these pies are all identical - but they share certain basics in common. 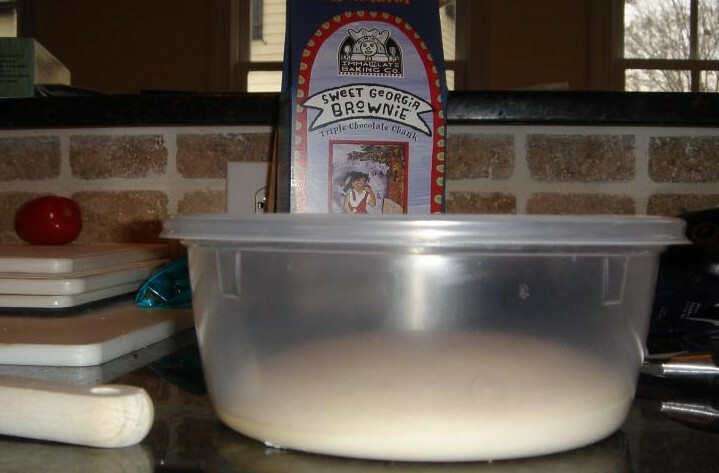 Sprinkle a yeast packet into warm water between 105-115 F and put in a teaspoon of sugar to feed it. Wait for it to foam up or 'proof'. Add all your flour to a Kitchen Aid heavy duty mixer, then add the yeast and salt. Now mix until it pulls away from the side of the bowl. Coat with oil and leave in a warm place until it doubles in bulk, about 1-2 hours. Punch down, spread on a peel with some cornmeal to keep it from sticking and put it on the magical pizza stone that will make this taste just like Sally's in your 500F oven. I assure you, this will not make anything like a real pizza. It's weird - even chefs whose other recipes all come out pretty good, like Emeril, simply pass around more or less this same terrible recipe. All other factors pale in comparison to these 3. I know that people fuss over the brand of flour, the kind of sauce, etc. I discuss all of these things, but if you don't have the 3 fundamentals above handled, you will be limited. If you use Caputo or any 00 flour, you may find that it takes a lot more flour for the given amount of water. Probably a baker's % of 60% or so. One reason I like to feel the dough rather than strictly measure the percent hydration is that with feel you don't have to worry about the type of flour so much. 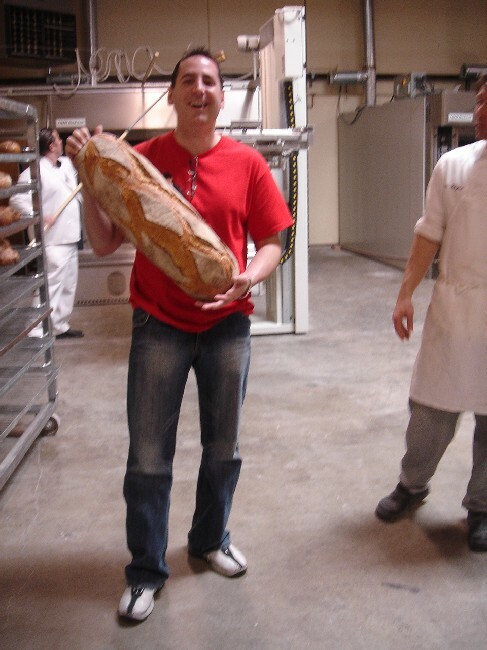 A Caputo and a Bread will feel the same when they are done, even though one might have 60% water and the other 65%. It's the feel that I shoot for, not the number. I vary wetness based on my heat - higher the oven temp, the wetter I want the dough. I've heard it said that NY has the best pizza because of the water. This is a myth. Get over it. It's not the water. The water is one of a hundred factors. I filter my whole house with a huge 5 stage system, so I use that. If I didn't have that I'd spring for a $1 bottle of Dasani. That will do it too. I use a sourdough culture that I got from what is probably the best pizza in the USA - Patsy's Pizza on 117th street in NYC. The place has been there for 80 years. The 'battery poolish' is about 50/50 water and flour. Buy the book "Classic Sourdoughs" by Ed Wood from www.sourdo.com to learn how to use a sourdough starter. The term sourdough does not necessarily mean that this has a San Francisco Sourdough flavor. The term sourdough just means any yeast other than "baker's yeast" which is what comes in the dry or cake form. There are 1000's of types of yeast. But the commercial products are all the same strain (Saccharomyces cerevisiae) regardless of the brand you buy or whether it's dry or cake form. Commercial or "baker's yeast" gives a fast, predictable rise, but is lacking in flavor. All other yeasts are called sourdough. San Francisco sourdough is one strain. But there are 1000's of others. I doesn't have to taste sour, like San Francisco, to be called sourdough. It's just a term. You can "create your own" culture by leaving some flour water out on the counter. There are lots of kinds of yeast in the air in your kitchen right now and one of them will set up shop eventually in your flour water and begin growing. What will it taste like? Well, it's like setting a trap for an animal and waiting for dinner. It could be a pheasant. It could be a rat. You have no way of knowing. Do yourself a favor and skip this part and just buy or obtain a known high quality starter. www.sourdo.com sells strains from the world's best bakeries. I've seen many bogus things about the use of starters. A classic is that you can start a wild culture by setting out some flour, water and baker's yeast and the baker's yeast will 'attract' other yeasts. This is alchemy. It's like saying I put out dandelions and they attracted peaches. It makes no sense. Another myth is that you can get the same flavor out of packaged yeast as you can out of a sourdough culture if you handle it right. This is also alchemy. Can you get parsley to taste like thyme if you handle it right? These are distinct organism, like spices, that all have a different flavor. If you use a starter, and you should, then learn from Ed Wood. A sourdough starter actually consists of 2 separate organisms which exist in a symbiotic relationship. There is the yeast and the lactobacilli. Here's the cliff notes version of what's happening: All flavor really comes from the lactobacilli, all the puff from yeast. The yeast operate well at high temp. The lactobacilli at any temp. Therefore, to develop highly flavored dough put it in the fridge. The yeast will be mostly dormant, giving time for the lactobacilli to produce flavor. The flavor takes a day or more. So you have to keep the yeast on ice that long. Then you take it out of the fridge and let the yeast take over and produce gas. The yeast only needs an hour or two to do this part. This can happen very quickly in a warmer. There is no need for a gradual rise, because at this point the flavor is there. You can smell the alcohol in the dough. The yeast are just adding the bubbles at this point. This technique of refrigeration is called a "cold rise". There are warm rise methods that work too, but I have not gotten the best results with them after numerous attempts. In Naples they virtually all use a warm rise, so I don't doubt the technique can be made to work well. I may revisit this section later. The lactobacilli and yeast exist in pairs. Not every flavorful lactobacilli has a competent yeast partner. You may find that you've got a culture that has a great flavor, but the puff is not there. No problem. Give it a boost with plain old Baker's yeast, which has little taste but plenty of puff. I use 1/8 teaspoon of instant dry yeast for each batch of 3-5 pies, to give it an extra rise, but 100% of the flavor is from the Patsy's culture. There are 2 ways to ferment the dough: you can use a 'warm rise' or a 'cold rise'. The warm rise is harder. You simply leave it out at room temp and wait for it to rise. This is hard to control because it could take 10 hours or 24 hours. Tiny, tiny variations in room temp and the amount of yeast you started with will make all the difference. And if it's not risen optimally when you use it, the dough may end up flat and lacking in oven spring. So timing a pizza party this way is hard. By far the easier way to ferment the dough is the cold rise. And the results are just as good if not better. I prefer to age my dough at least 2-3 days in the fridge. I've aged it up to 6 days with good results. However, my culture is very mild. With some cultures 24 hours is the right amount of time and 2 days would be too much.. You have to get to know your culture. They are all different.. 24 hours is the minimum with a cold rise. There's more on this technique down below. 2- Flour: There is a lot of emphasis put on using the right type of flour. Personally, I think this focus is misplaced. Of course, it's important to use high quality ingredients. But improving your dough making technique is much, much more important than hunting down the exact right type of flour. The truth is that almost all flours sold are pretty high quality especially compared to what was available 60 years ago when Patsy Lancieri was making amazing pizza. That alone should tell you something. I currently use either using King Arthur Bread Flour or a blend of this with Caputo Pizzeria flour. I actually think that you can buy any bread flour available at your local supermarket and you'll be ok. Lately I've gone back to using King Arthur Bread Flour. I've used AP successfully as well. The kneading seems to be more critical. Most pizza places in NYC use Hi Gluten Flour and many internet sources insist that Hi Gluten Flour is necessary to make real NY pizza. This information sent a lot of people off ordering expensive mail order flours. 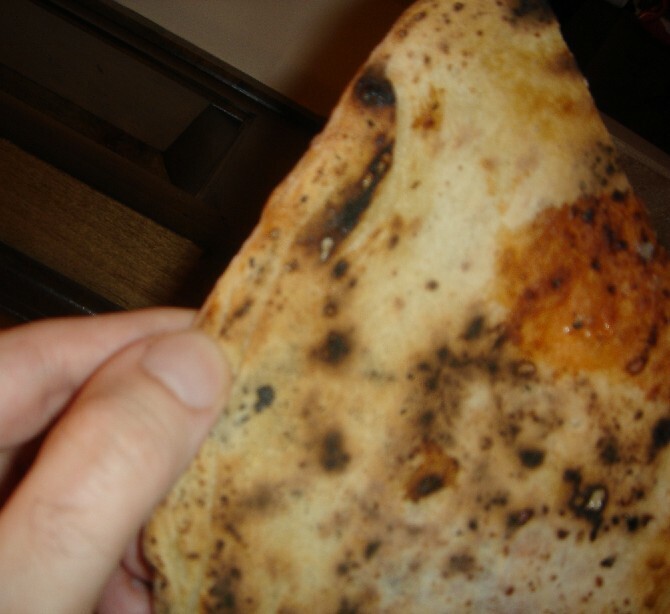 However, according to pizza guru Evelyn Solomon, the old timers used flour in the 12% range, which would be a bread flour. This confirmed what my own tests had shown me all along. Bread flour from the supermarket is just fine for making pizza. It has certainly been proven that you don't need high gluten flour to make highly structured bread. 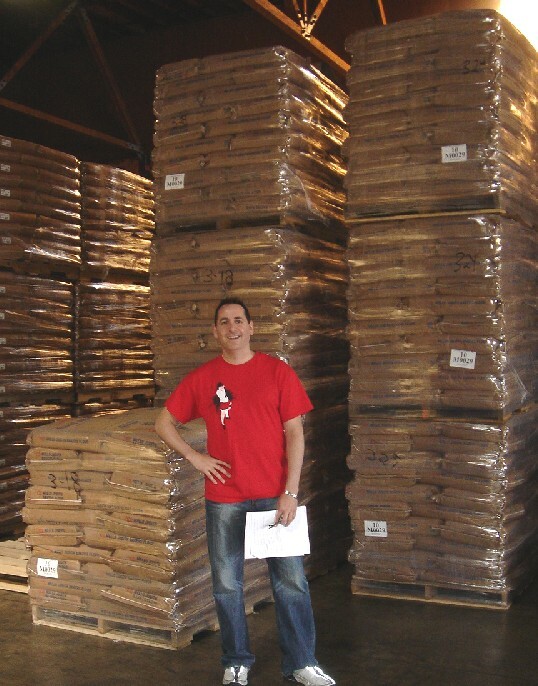 Ed Wood from sourdo.com makes great artisan bread using AP. In Naples they use 00 flour which has less gluten than AP. I've had great and horrible pies with all kinds of flours from all kinds of pizzerias. And I've made great and d horrible pies with all kinds of flours myself. Kneading and overall technique is more important than the flour in my opinion. I can make a nearly identical pie with any of these except for the Italian 00 flour. It's mostly technique. I'm not saying that the type of flour makes no difference, but I am saying that it's a small difference and I've had great pies from restaurants with varying types of flour. Don't get too hung up on it. One is not 'better' than the other, it depends on the style you want. Currently I use a 50/50 blend of Caputo and KA Bread. Caputo gives bigger bubbles and a lighter spring. But I prefer to mix it with Bread flour to give it more strength. 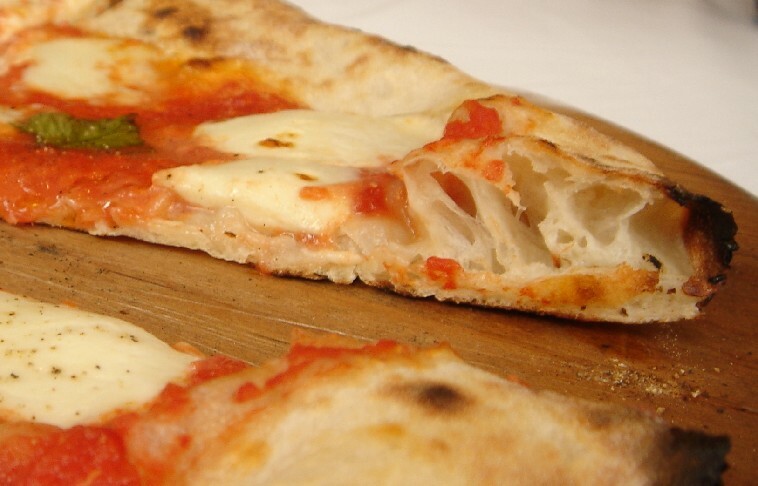 In Naples, the dough is very soft and hard to hold and often eaten with a knife and fork. 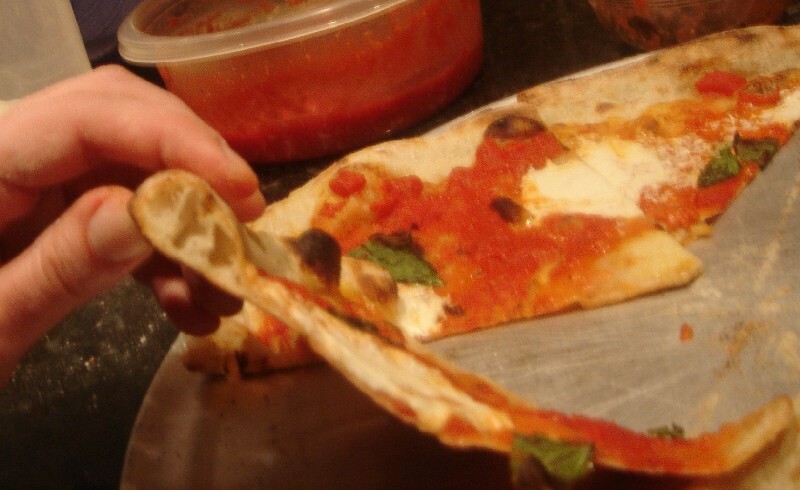 NY street pizza is easily folded and held. They typically use a strong Hi Gluten Flour. My pies are closer to the Neapolitan, but not quite. You can still hold it, but sometimes it flops a bit at the tip. The 00 has a finer mill and also it will absorb much less water than the other flours. The 00 flour really is quite different than the others. If you are baking at under 750F, you should really not use 00. It will never brown and you'll have much more luck with another flour. 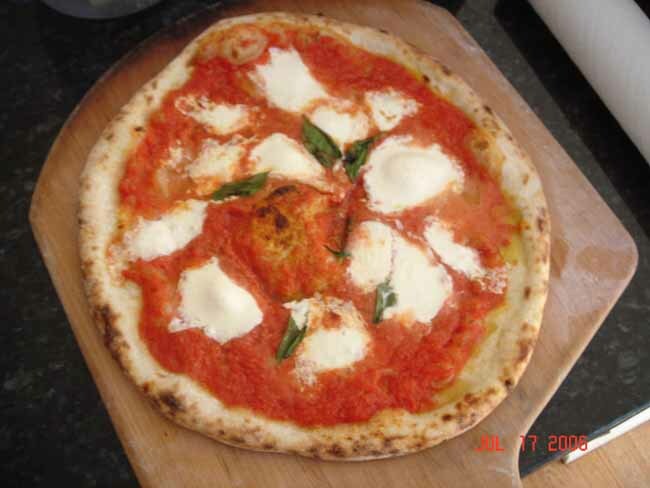 The ratio of Flour and water can dramatically change the characteristics of the dough. Having said that though, I don't measure my "% hydration". I do it strictly by feel. Lately my dough has been much much wetter than ever before. Wetter dough stretches easier with less pull back. It seems to develop faster in the fridge. And it provides more steam for more puff in the final baked crust. The higher the temperature of the oven, the wetter the dough should be. At super high heats needed to make a pie in 2 minutes or less, you need a lot of moisture to keep it from burning and sticking to the baking surface. 3- Kneading - This is one of the most important steps. Follow along carefully. There are 100 recipes on the net that say you dump all the ingredients together, turn the machine on and you will have a great dough. It's not true. But once you understand these steps your dough will transform into something smooth and amazing. Autolyse - Autolyse is a fancy word that just means one simple thing. The flour and water should sit together for at least 20 minutes before kneading begins. It's a CRITICAL step. Some say that you should mix just the flour and water together, then after 20 minutes add the salt and yeast, then mix. Others say you can add all the ingredients at the beginning. I have found very little difference. There is no need to dissolve the yeast in warm water or feed it sugar. 'Proofing' the yeast was probably required decades ago, but I've never had yeast that didn't activate. The yeast feeds on the flour so you don't need to put in sugar. The proofing step that you see in many recipes is really an old wives tale at this point. This part is critical and it's something that I did not understand at all until relatively recently: Even if the dough is very sticky - that is it does not have enough flour in it to form a ball and it is still halfway between a batter and a dough - it is still working. This is where MOST of the kneading occurs. The gluten IS working at this point even though it's not a dough yet. After the first 6-8 minutes increase the speed of the mixer slightly. I never go higher than 1/3 of the dial on my mixer. 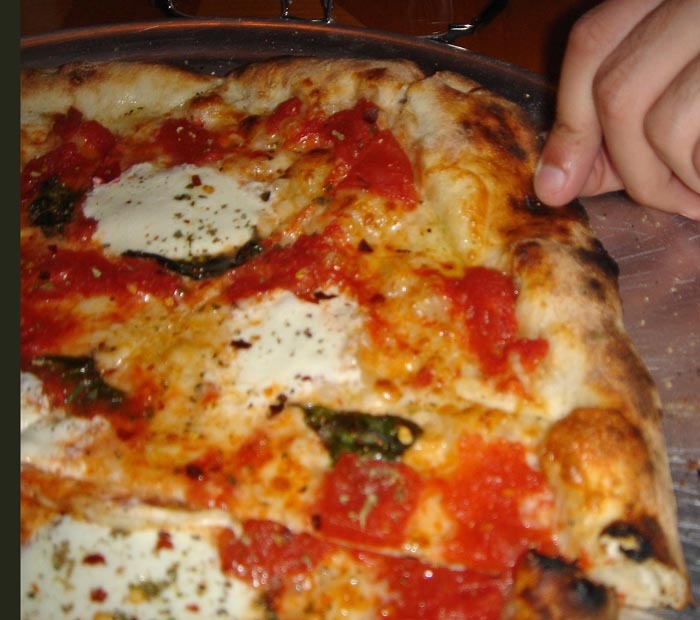 Keep in mind that in the old days they mixed this by hand (Anthony at Una Pizza Napoletana in NYC still does). You should add most of the remaining flour. But you still want a very wet dough, so don't go crazy. At some point during this process the dough should be getting much firmer and should form more of a ball. Mix another minute or so a this stage You may find that the dough is sticking to the roller /hook and not really working too much at this point. This is why it's so important to do most of the mixing at the earlier, wetter stages. Once the dough is at this point, it is done. My recommendation is this: DON'T BE A SLAVE TO RECIPES AND PERCENTAGES. It's fine to use the spreadsheet or other measures as a guideline, but you have to judge how much flour goes into the dough by feeling it. Do NOT force more flour into the mix just to reach a number. If the dough feels good and soft and you still have flour you have not put in, don't sweat it. Leave it out. In the end you need a wet dough. 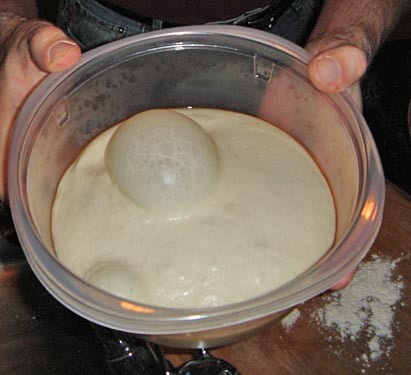 In fact, even the dough has formed more of ball, if you let it sit, it should spread out a little and look a little limp. This is what you want, not a tight ball, but a slack, wet soft dough. One of the best ways to see how your dough is doing is to sprinkle a little flour on in and just feel it. It should feel baby bottom soft. If you don't sprinkle flour it will just feel sticky and not look smooth. But sprinkle a tiny bit of flour and now its soft and smooth. This is what you want. This is a much gentler recipe than most and it shows in the final dough. With Hi Gluten flours a commercial mixer and a dry dough, you will find that the dough is tough to work and consequently both the machine and the dough will get very hot. Commercial bakers compensate by starting with cool water and by measuring the temperature of the dough as they go. The procedures I'm outlining don't require this. The wet knead technique and the lower protein all but eliminates the friction. You can expect the dough to heat only about 3-4 F while mixing, so it's not an issue. 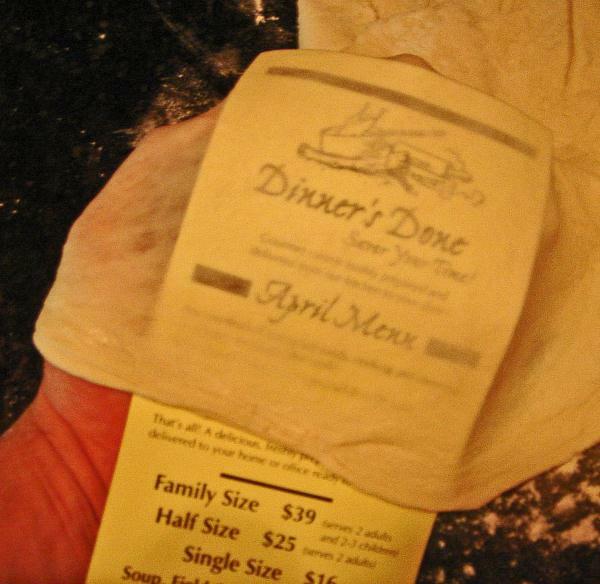 Yes, this dough is so thin, you can read right through it. This is what is meant by "windowpaning". You never actually stretch it this thin when making a pie. But I just want you to see what is achievable. In fact, you can make an excellent pie without getting it this well kneaded. But you should know how to do this as part of your overall repertoire. 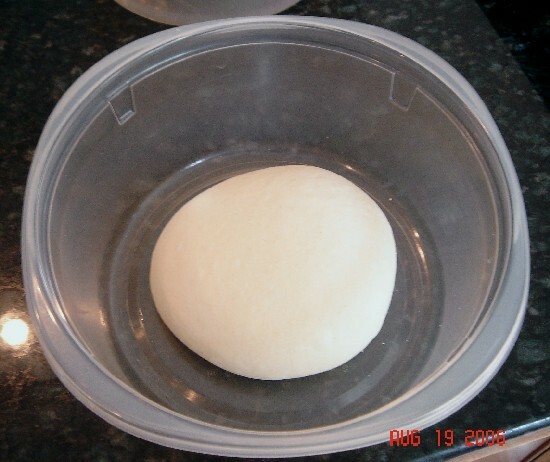 This dough would never rip or fight with you when being stretched to perfect pizza size. This dough was made with King Arthur Bread Flour, not high gluten flour. You can achieve this windowpaning even with All Purpose flour. Technique and not the starting protein % is the key. Pour out onto a floured surface and portion into balls with a scrapper. I use a digital scale. The dough at this point should be extremely soft and highly elastic. I use 310g per 13" pie. The more elastic the dough, the less you need. I store the dough in individual 5 cup Glad plastic containers as you see below. I wipe them with an oiled paper towel - super thin coating. This will help them come out of the container. But I don't want any oil in the dough. 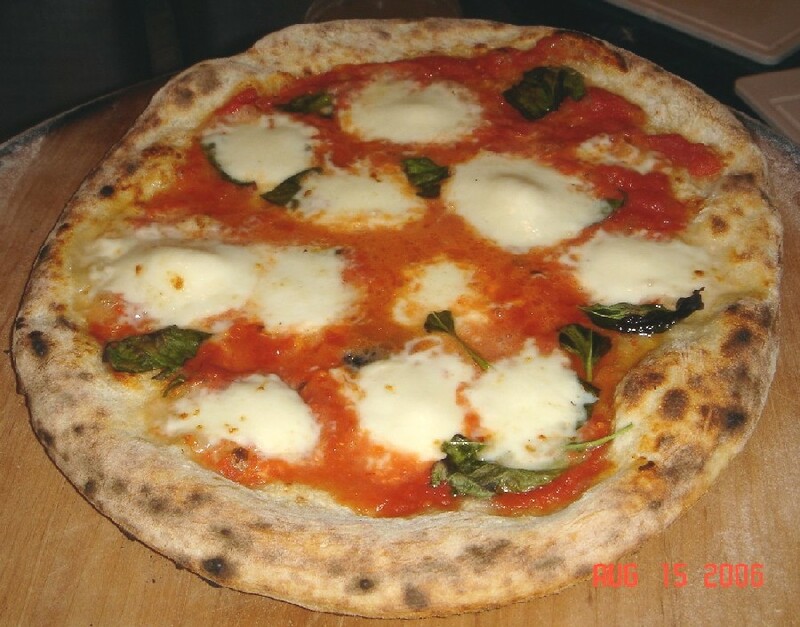 The rules for "Vera Pizza Napoletana" say no oil. I probably have literally one or two drops per ball. Oil the container and not the dough. You only need a drop or two of oil cover a whole container - you can kind of polish it with oil using a paper towel. In contrast, you'd need a teaspoon to oil the dough because you can't spread it so thin. Also the ball would probably need oil on both sides, which is bad because by oiling the top of the dough (which will end up being the bottom of the pizza), you are going to get oil on your pizza stone which will burn at high temps in an unpleasant way. Since you want to minimize the amount of oil, oil the container. For similar reasons, I don't use zip loc bags. Use a container. It almost pours out (with a little push from a spatula). But you can see how easily it stretches and how wet it still is. I don't know the %hydration of this dough but it is 65% or higher, I'm sure. I've got like 15 of them. They are perfectly sized for individual dough's. I strongly prefer these to plastic bags. They are sealable and that keeps in the moisture. They stack easily in the fridge, and the dough comes out easily and without deflating the dough in the process. I spread the container with a drop or two of olive oil. I let them rest another 10 minutes, then put them in the Fridge for 1-6 days. If your dough is very wet it may start out as a nice looking tight ball, but over time in the fridge it looks like it's sinking into a disk. This may appear worrisome. When you see dough sinking there may be several causes. Dough that is 'slack' - overworked and/or old, will sink like this. But if you've followed these instructions this is not the reason your dough is sinking. 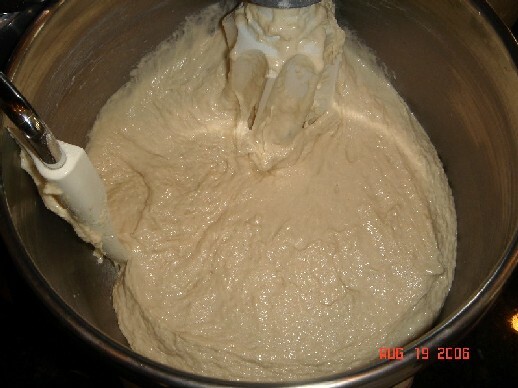 The sinking is caused by the fact that the dough is very wet. Don't worry about it. It's probably going to be very good. This is the dough several days later. It's been sitting out warming up for about an hour. Notice that it has not risen that much. It does have more volume - probably about 50% more than the dough above. But it's also changed shape - it's so wet and soft and when it rises it kind of just spreads out. This is what you want. 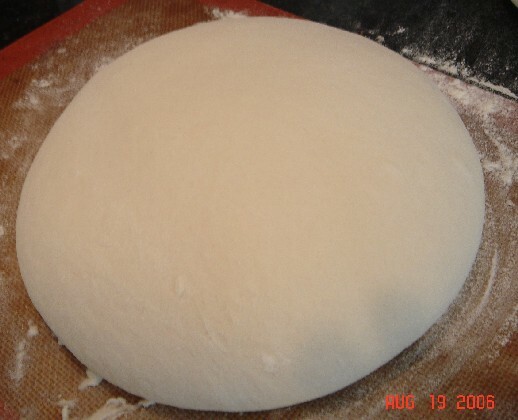 This dough is ready for baking. 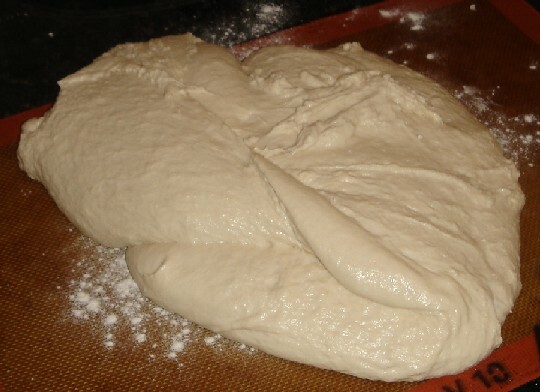 Most recipes say that the dough should double in size. This is WAY too much. In total the dough should expand by about 50% in volume. It would seem like the more yeast bubbles in the dough, the lighter the pizza will be. This is the intuitive guess. But it's not true. The yeast starts the bubbles, but it's really steam that blows the bubbles up. If the yeast creates bubbles that are too big, they become weak and simply pop when the steam comes resulting in a flat dense, less springy crust. Think of blowing a bubble with bubble gum. How tight is a 2 inch bubble? It depends: As you start with a small bubble and blow it up to 2 inches it's strong and tight. But at 4 inches it's reached it's peak.. Now if it shrinks back to 2 inches, it'll be very weak. So a 2 inch bubble is strong on the way up and weak on the way down. You want bubbles on the way up. If the dough is risen high, the bubbles are big and the dough will have a weaker structure and will collapse when heat creates steam. The lightest crust will come from a wet dough (wet = a lot of steam), with a modest amount of rise (bubbles formed, but small and strong). Some people start with a warm rise for 6 hours or so, and then move the dough to the fridge. I'm not a huge fan of this method. Once the bubbles are formed, I don't want the dough to get cold and have the bubbles shrink. This weakens their structure. What you want is a steady slow rise, with no reversals. Always expanding, just very, very slowly. My oven takes about 80 minutes to heat up. The dough finishes rising in about the same time. So I take the dough out and start the oven at the same time. 80 minutes might seem like a fast rise, but the real development is done in the fridge. Here is where experience will make a difference - I look at my dough a few hours before bake time and I make an assessment. If the dough has not risen much in the fridge I will take it out earlier than 80 minutes. If it's risen too much, I leave it in the fridge till a few minutes before bake. It really takes a good eye. You can make a last minute adjustment to speed it up by warming it. Before I turn my bottom oven on the cleaning cycle, I warm up my top oven to about 95F. If I think I need to speed up the dough, I can then place it in the 95F environment for while before baking. It's a little harder to make an adjustment the other way. If I find that it's rising too fast and my oven won't be ready for an hour, I'm kind of out of luck. I could chill it, but it's going to weaken if I do that. So I try to err on the side where I still have some control. The softer the dough, the faster the rise. It's simply easier for small amounts of carbon dioxide to push up on a softer dough. If the dough falls a little after rising, you've waited too long and you will find it's past it's prime. Ideally you should use it well before it's at it's peak. This takes experience. You are better off working with a dough that is under risen, than over risen. Over risen dough (don't do this). 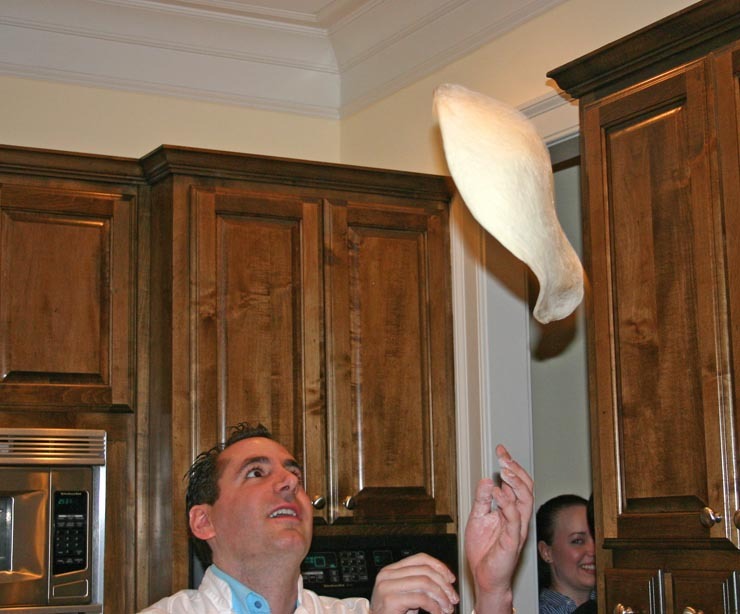 When you spread the dough, you will find that it's not great for spinning over your head. It would have been really great at this when you first did the windowpane test. But now that it has risen it's soft like butter and just stretches easily. Don't worry about the spin. If you want to impress everyone with spin, make a drier dough with a hi gluten flour and more salt and let it age for just a few hours and you can spin all you want. Spread the dough on the counter and then move to the peel. Marble is the perfect surface for spreading dough. One goal is to use very little bench flour, especially if you are cooking over 800F. 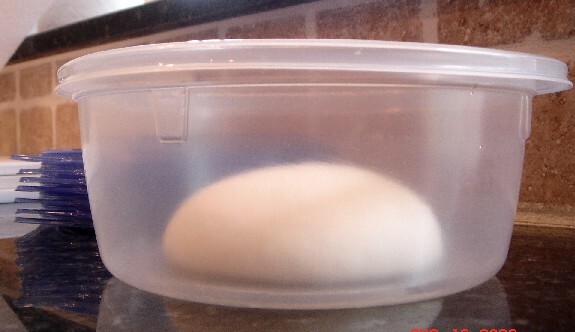 At high temps, the flour will turn bitter, so you are better off shaping on the counter, then moving to the peel, which will result in less bench flour. With a very wet dough this takes some practice. You don't necessarily have to use a lot of bench flour, but it does have to be even. You don't want the dough sticking to the peel, of course. I put flour in a bowl and dunk the dough lightly, getting all sides including the edge, then move it to the granite counter. I put just a tiny amount on the peel, which I spread evenly with my hands. When I move from the counter to the peel, most of the flour on the dough shakes off.. Once on the peel, shake it every once in a while to make sure the dough is not stuck. Always shake it just before placing it in the oven, otherwise you may find that it's stuck to the peel and falling off unevenly onto the stone. At that point you probably can't recover well and you'll make a mess. So always shake just beforehand. When I make the pie, I work quickly, so as not to let the moisture in the dough come out through the tiny dry flour coating. Then, and this is important, I shake the peel prior to putting it in the oven, just to make certain it's loose. In fact, you can shake it at any time during the process. If you are taking too long to put on the toppings or there is some delay, shake again. Make sure it never sticks. Don't resort to using too much flour or any cornmeal or semolina. It just takes practice to use very little flour, yet still keep it from sticking. If you've made the dough correctly you should be able to spread it with no problem. If it is pulling back on you and trying to shrink, you have not mixed it enough. If you've done half the steps above, you should not be experiencing this problem at all though. This photo is from the same pie as this one. This pie was very interesting for many reasons. Although I have a lot of practice handling wet dough, this is the first time I've tried to hand knead in at least 5 years. I started in bowl with 75% of the Flour (KA Bread), the salt, water, poolish and a pinch of IDY. I did a 12 minute autolyse, 6 minute hand mix with a spoon, adding flour along the way and 15 minute post mix rest. Then I hand kneaded for 1 minute. Did another 5 minute rest (It didn't feel smooth, so I wanted to rest it again), then another 30 second hand knead, then shape. I'm guessing it was a 65-66% hydration, same as the dough photos above. I know that is very high for a hand kneaded dough and it takes some practice. But it didn't stick to my hands at all because I've gotten used to how to handle high hydration dough. The trick is to keep the outside dry with just the thinnest coating of flour. Actually, I only keep the side near my hands coated, the other side is wet. 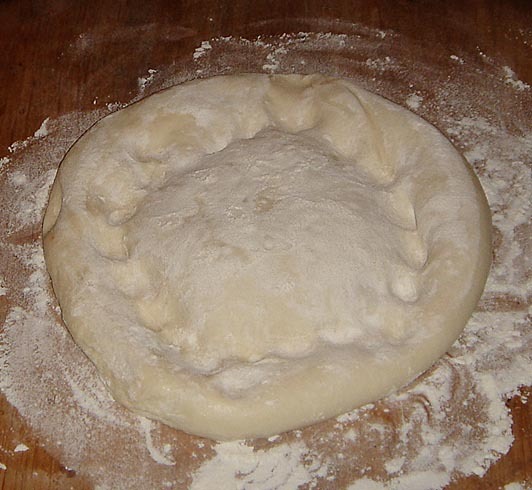 Then I pull the dough expanding the dry side and close it in towards the wet side. This is repeated over and over. As the dry side stretches, it gets a little wetter, then your just dip in in flour again and continue. This baked for 1:40. The cheese, unfortunately, was Polly-O dry mozz as I was desperate. On most ovens the electronics won't let you go above 500F, about 300 degrees short of what is needed. (Try baking cookies at 75 instead of 375 and see how it goes). The heat is needed to quickly char the crust before it has a chance to dry out and turn into a biscuit. At this temp the pizza takes 2 - 3 min to cook (a diff of only 25F can change the cook time by 50%). It is charred, yet soft. At 500F it takes 20 minutes to get only blond in color and any more time in the oven and it will dry out. I've cook good pizzas at temps under 725F, but never a great one. The cabinet of most ovens is obviously designed for serious heat because the cleaning cycle will top out at over 975 which is the max reading on my Raytec digital infrared thermometer. The outside of the cabinet doesn't even get up to 85F when the oven is at 800 inside. So I clipped off the lock using garden shears so I could run it on the cleaning cycle. I pushed a piece of aluminum foil into the door latch (the door light switch) so that electronics don't think I've broken some rule by opening the door when it thinks it's locked. Brick ovens are domed shaped. Heat rises. There is more heat on top than on the bottom. A brick oven with a floor of 800F might have a ceiling of 1200F or more, just a foot above. This is essential. 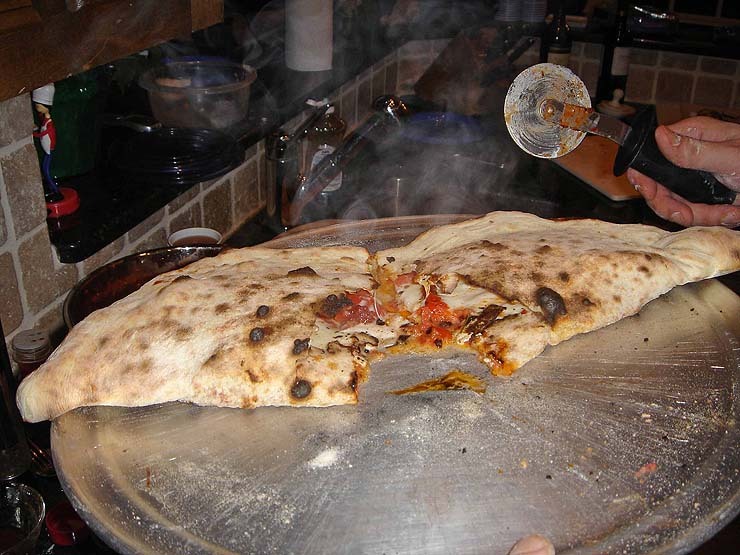 The top of the pizza is wet and not in direct contact with the stone, so it will cook slower. Therefore, to cook evenly, the top of the oven should be hotter than the stone. 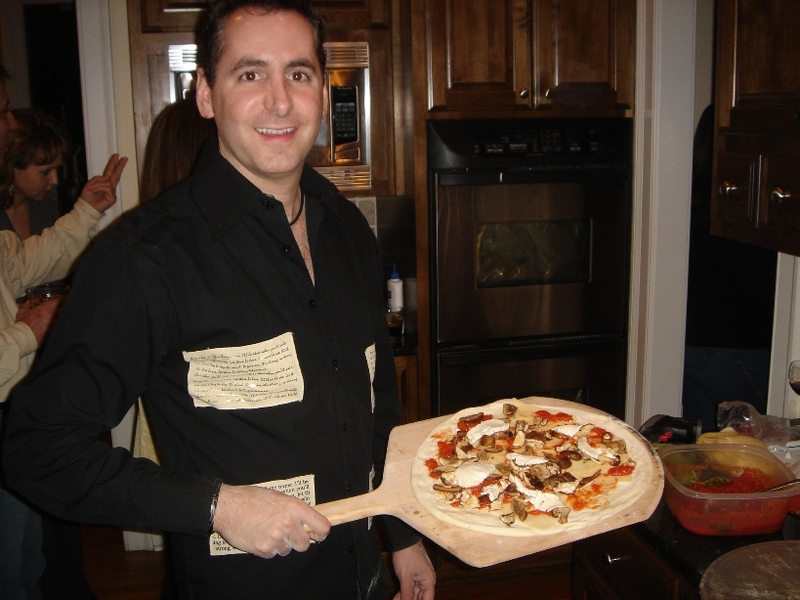 To achieve this, I cover the pizza stone top and bottom with loose fitting foil. This keeps it cool as the rest of the oven heats up. When I take a digital read of the stone, I point it at the foil and it actually reads the heat reflected from the top of the oven. When it hits 850, I take the foil off the top with tongs and then read the stone. It's about 700-725. Now I make my pizza. As I prep, the oven will get up to 800Floor, 900+ Top. Perfect for pizza. Different ovens have different heat distributions. I experimented extensively with foil to redistribute the heat. I tried using one layer, multiple layers and I adjusted the amount I used on the top and the bottom. I also played with using the shiny side up or down, etc. Eventually, I worked out a simple system for myself. Some have tried to get high heat using a grill. This can produce high heat, but all from the bottom. One could adjust the differential, by playing games with foil. But an oven with heat from above is better. I make sure that I cover any oven glass loosely with 2 layers of foil because it will shatter if a drop of sauce gets on it. With the foil it's fine. I make sure the foil is loose. If it's fitted to the glass, it will transfer heat too quickly and the glass is still in jeopardy. Another problem is that once the cleaning cycle starts, it just pumps heat into the oven and I can't reduce the temp. If I get a late start (my guests are late or my dough needs another 30 minutes to rise), I can't just shut off the oven and then start it up again in 15 minutes. Once I cancel the cleaning cycle, I can't start it up again until the oven cools below 500F (at least on my Kitchen Aid oven). Therefore I have to wait and cycle back around. It's like an hour ordeal. But I have worked around these issues and I now have enough experience that I can pretty much control my temperature. I can cool the stone, for example, by placing a metal sheet pan on it for a minute or so. It will absorb a tremendous amount of heat very quickly. I never do this with Teflon which releases unseen toxic chemicals over 600F. I Remove this pan with the peel, rather than with oven mitts to prevent burns. Occasionally I also place something in the door jam, like a meat mallet, for a few minutes to let heat out. 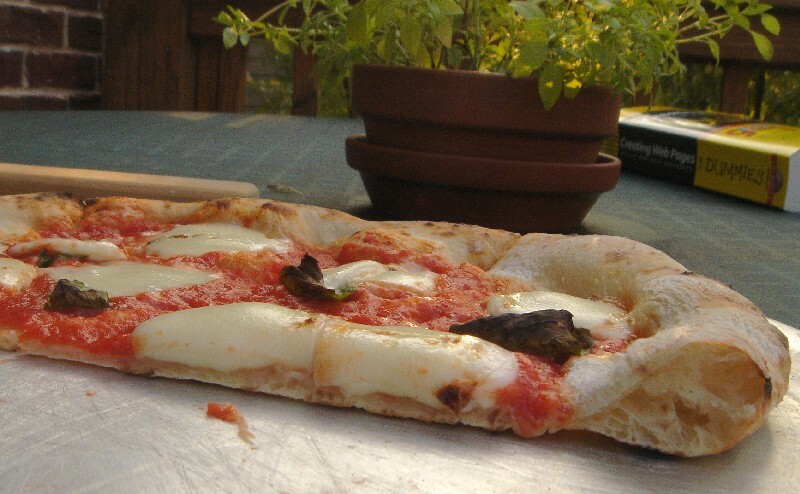 Brick Oven vs. Other Ovens: I have a list of my favorite pizza restaurants at the bottom. All but one of these use coal fired brick ovens. But interestingly, the number 1 place uses a regular old gas fired oven that you see in any pizza store in NYC. This is Johnny's in Mt. Vernon, NY. Worth a pilgrimage for sure. They also use dry sliced Mozzarella instead of fresh. Go figure. That place is an enigma. They are also very secretive. I can tell you they definitely use a sourdough culture because I obtained it from pizza place across the street (yeasts can take over a neighborhood) but it died out. I'm going to get it again someday. Mmmmm. 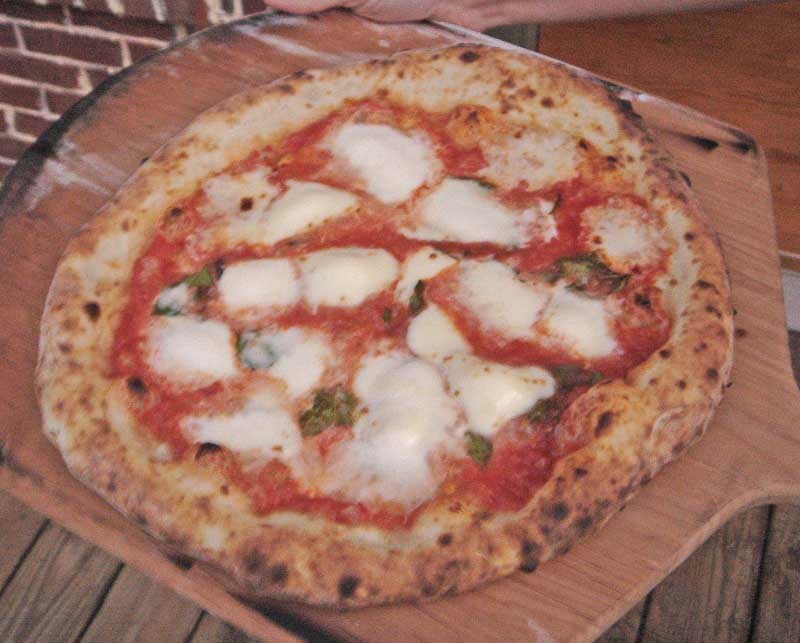 You don't need a brick oven to perfectly char a pizza. This was done in an electric. Patsy's is #2 on my list. It used to be #1 but my last 3 trips to were disappointing. There is a new guy working the oven and the pies are coming out like dry crispy flatbreads. It was NOT good. And I saw a review in a magazine that had a photo of a Patsy's pie and that one also looked dry and crispy and the article even described it that way. Yuck!. The reviewer at SliceNY.com also mentioned that he might downgrade Patsy's if they slip any more . So this means that Johnny's, which used to be tied with Patsy's, now sits alone at the top of my list. I've got it as Johnny's, Patsy's, Sally's, Luzzo's, Una Pizza Napoletana, me, then Sac's. Frankly, if they don't shoot the new cook, Patsy's could drop from my top 5 because right now it's resting on it's laurels. Lombardi's is just OK in my book. Nods for history, but too thick and gummy. Grimaldi's and John's are not in my top 10 either. But the original Totonno's is up there somewhere. Back to the Brick oven thing. I once bought a Patsy's dough and rushed it home to my oven in Atlanta and baked it. The dough itself was incredible. It was the most windowpaning, blistering and elastic dough I've ever seen, by a wide margin. Very impressive. But when I baked it, it was just ok. It tasted a little flat. It had less of a charred flavor even though it had a charred color. It actually tasted exactly like my own pies tasted at that time. By that was a long time ago. My own latest pies have overcome a lot of this. I'm aging my dough longer than Patsy's and I think that is making up for some of the difference. My opinion is that the coal and the fire adds about 10-20% but the rest is the heat distribution. If you can get that right in a regular oven, you are going to be thrilled with the results. Johnny's proves this beyond a shadow of a doubt. My latest pies are nearly perfect too. Some of these pies look & tasted just like a Patsy's pie, I'm not sure you could tell the difference. And believe me, I notice small differences or I wouldn't have come this far. These latest pies are really, really close. The photos above, as well as those below are good examples. I can't get advantages of the brick oven, but I make up for it by aging the dough longer and this imparts extra flavor. Of course, if you do have access to brick oven, especially one that uses coal, by all means use it. But LEARN to use it. I've seen too many brick oven places that make terrible pizza. Why? Because they think that having the oven is all they need to do. You still have to have everything else right. And I've even seen brick ovens where the heat is not right. I just saw a place with a Brick oven that had it set to 395F. Such a total waste of time. The oven does not work by magically transmitting brick flavor into the dough. It works by generating more heat than a regular oven. At least that's 90% of it. Yes there is a dryness to the wood burning and a smokiness and these are advantages of a brick oven. But mostly it's the super high heat that is important. Go the extra mile and get yourself the right digital thermometer and work the oven correctly. This will take a lot of practice. Check out Frankie G's cool brick oven and video. My first Brick Oven Experience: I just tried a friend's brick oven. We had a lot of trouble holding the temp right and most of the pies were cooked at 500-600F. So I'm not done experimenting yet. But I can say this: a 7 minute pie in a brick oven does taste better than a 7 min pie in an electric. So there definitely is something good going on in that oven. It has to do with the dryness of the bake. I will post more on this as I make progress. 6- Dry mozzarella cheese: This step is totally optional and I don't do this anymore. Early on I was having problems with my mozzarella cheese breaking down due to the high heat. I was also having problems with the sauce sogging up the dough. So I used dry boars head mozzarella, sliced on a machine under the sauce. This protected the dough. But I've since improved both my sauce and wet mozzarella management so I don't use dry cheese anymore. However, I should note that the only pie that I've tasted that might actually be better than Patsy's is Johnny's in Mt. Vernon. They use only dry sliced cheese. I'm not sure of the brand, but it is fantastic. Patsy's does not use this step, nor is it true Neapolitan. 7- Lay fresh basil right on the dry cheese or sauce. It's important that the leaves get a bit wet or they'll just burn. Just tap the tops with the bottom of the sauce spoon to moisten. Basil is great fresh out of an herb garden. I will post more on this someday. Don't wash your basil. It just kills it. 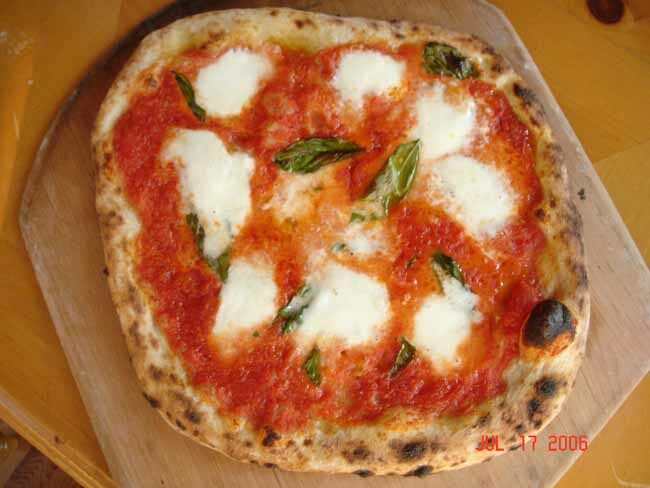 8 - Sauce: For years I was so focused on the dough that I let the sauce lapse. I just didn't do much with it. But now I feel that my dough is consistently great, I have focused more on the sauce and it has really transformed into something wonderful. The key step is something I call 'Tomato Rinsing". But first let's start with the tomatoes themselves. There is a lot of talk about buying tomatoes grown in the San Marzano Valley which has rich volcanic soil. Others claim the region is now polluted. I don't know. All I know is what I taste. I've not been too impressed with San Marzanos I've tried. These are in rough order with the best at the top. I have not this one, but Marco vouches for them, so they might be excellent. I don't think they are easy to find though. I know that Patsy's buys from Sassone in the Bronx (where I grew up). But I haven't tried a case yet. They may be repackaging any number of brands. Everyone vouches for Escalon, but I dislike them. The Escalon are round tomatoes, whereas most of the Italian brands are Plum tomatoes, which I strongly prefer. I also prefer the plain Cento Italian over the Cento DOP Certified San Marzano. Be careful of marketing tricks like cans that say Italian 'Style' instead of Italian. Italian Style means nothing. It's subjective. If I grew tomatoes in Chernobyl I could still claim they are Italian Style. Similarly there's a San Marzano 'Brand' which is grown in CA. I hate marketing gimmicks like that. The put the word 'brand' so small that you can barely read it. If you want to go crazy and make your own, try 'ugly ripe' heirloom tomatoes. The taste of these are amazing and I use these when I need whole tomatoes. DON'T make a sauce. That is, don't pre-cook the tomatoes. The tomatoes will cook on the pizza. 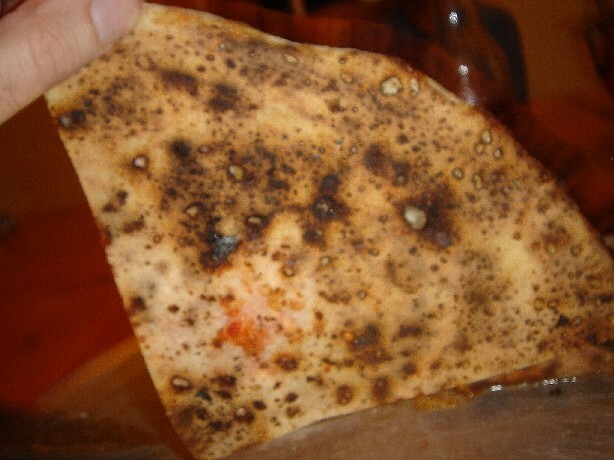 If you cook a sauce first, it will cook again on the psizza, turning it brown and yucky. No need to make a sauce. Look at how overcooked many sauces are. The best places don't do this. This is actually the one step in this whole process that you can save yourself some time. Now crush the tomatoes. This is one of those areas where I made a recent change for the better and it's really helped a lot. I used to crush the tomatoes by hand. But it was always a bit chunky. Now I blend them with an immersion mixer ("boat motor"). I cannot tell you exactly why this has made a huge improvement in the TASTE of the tomatoes, but it has. I've done side by side taste tests. The tomatoes should be crushed but not pur ed. Go Easy. I have nothing against using a food processor or mill, but I will say that you should not crush by hand. Tomato Rinsing: All cans have some bitterness. You need some bitterness and you don't want to strip all of it out. But if the can is too bitter it's not good. I have a procedure I call tomato rinsing to remove some of the bitterness. But you have to taste the can and determine for yourself if it needs it. The better brands on my list don't. 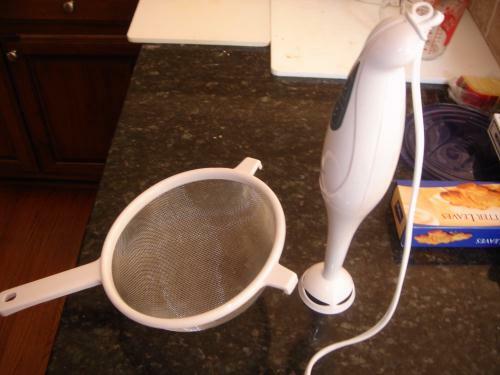 Here's the Tomato Rinsing procedure: Strain the tomatoes in a fine mesh strainer.. If the mesh is fine, the water will be mostly clear with very little tomato escaping. If the water escaping is very red, pour it back on top of the tomatoes and continue straining. Eventually the water will run almost completely clear. Here's the key. The water that comes out is completely bitter. Taste it. What I do is pour fresh water on top of the strained tomatoes and strain them again. Taste this second batch of water. It's also bitter but less so. You are removing bitterness and acid without losing a drop of red tomato. Instead you are replacing this bitter water with fresh water. You can repeat this several times if you like, but once or twice is usually fine. The net result is that what is left over, which is all the red tomato solids, is sooooo sweet and yummy. Here are some other things you can do to remove the bitterness. But don't go crazy adding tons of spices and things. It's mostly just tomatoes. A bit of sugar will also help 1/4 - 1 teaspoon. Taste and see. So you are removing and then adding back water. In the end though you should have less water than you started with. The total weight is probably about 1/3 less than you started with. But the exact amount of water you remove depends on the overall temperature of the oven and the temperature differential in the oven.. There is not much time in a hot oven to evaporate the sauce, so the hotter the oven, the drier the sauce must be going in. But if the top differential is high, the sauce will evaporate too quickly and needs to start wetter. You have to test. Surprisingly, if the sauce is too dry, it's not as sweet. You don't want it soupy but don't overstrain either. This will take real practice with your oven. Sometimes after the first pie I add more water to my sauce. Again, this is another area where recent improvements have really transformed the sauce. I think that when the sauce is chunky (hand crushed) it's harder to get the amount of water right. If you are using a very hot oven like I am, don't go too close to the edge. Too much sauce near the edge will keep the cornice from developing well. In most of the photos below I put the sauce too close to the edge myself. I will be more conscious of this as I go. An alternative to canned tomatoes is fresh tomatoes. Even the best cans have a tinny odor, so you'd think that nothing could top fresh tomatoes. But using 100% fresh tomatoes is not necessarily the best thing. If you prepare fresh tomatoes and taste it raw, compared to canned, the fresh will win. But somehow, on the pizza, the canned will win. Partly it's that the fresh tomato taste is simply different than we are all used to and so it never tastes like your favorite pizza place. I've probably not experimented enough to say for sure. As I stated above, I don't recommend cooking your sauce before making a pizza, because the tomatoes will cook again on the pizza. If you think about it, the canning process itself forces the tomatoes to be heated once before sealing, then if you cook a sauce, that's heating #2 and then the pie is #3. So I recommend cutting back to 2 times. If you switch to fresh tomatoes though, you are back to just 1 time, on the pie itself. And for a 2 minute pie, that is not very much. So perhaps a solution, if you are using fresh tomatoes, is to cook a sauce. I will experiment a little more and edit this section. Start with great tomatoes. I use "ugly ripe" heirloom tomatoes. These are the best to me. FYI, they are really amazing raw for a caprese salad (tomato, Mozz, basil, oil, balsamic, salt, pepper). Other heirlooms are probably good also, as are fresh picked local tomatoes. After that I'd probably go for plum tomatoes. I'm not a huge fan of the vine-ripe brand. They look great, but the taste is so-so. Regular beefsteak tomatoes are really not worth the effort. Added a tiny amount of sea salt and a few fresh basil leaves from the garden and that's about it. 9- Grate some Locatelli Romano and/or parmessian cheese right on top of the tomatoes & basil (do this whether you put some romano into the tomatoes or not). But don't over do it. Just a TINY little bit. But don't skip this step. It's really key to the sauce. Balance, balance, balance. 11- Fresh Mozzarella. I live in Atlanta, and getting good cheese is a real problem. It's the weakest link in my pie right now. In NYC all the mozzarella is packed in water, but it is still firm. Down here in Atlanta, I can't find great fresh mozz. It's either dry cheese or else water logged. If the cheese is too wet, it will break down on the pizza and even disintegrate into ricotta. Ricotta is made by processing the leftover water used to make mozzarella. If the mozz is not made right, it will actually break down into ricotta before your eyes. Not good. You can see this in some of my photos. 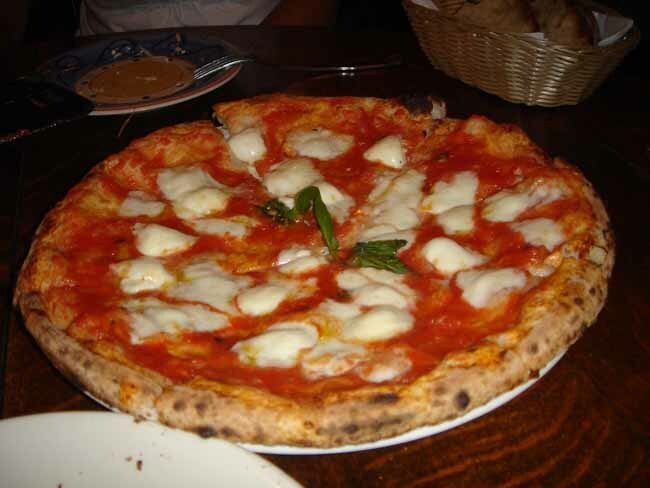 In Naples they use Bufala Mozzarella which is made from water buffalo instead of cows. The problem with using Bufala Mozz here in the US is that it's mostly imported and usually not that fresh, especially during the summer. If you can find a good supplier, then use it. Also, note that all fresh dairy products sold in the US are made from pasteurized milk, whereas the European versions are often unpasteurized. If you've ever had butter or cheese in Paris, for example, you know that what we get here is bland in comparison. So reproducing what you tasted on your trip to Italy is difficult. There are a few American suppliers of Bufula Mozz including http://www.starhilldairy.com/prod_mozzarella.shtml which is available at many Whole Foods. Dry the cheese extremely well by wrapping in a paper towel for 1-3 hours. You'd think the wetter it is the better it would hold up to the heat, but its not so. The water inside boils and degrades the cheese. Sometimes the cheese is so wet I have to change the wrapping several times. This might be avoided by simply draining for a long long time. I think Marco says he drains for 8 hours. Many cheeses packed in water are unsalted. If this is so, put in 1/4 teaspoon of kosher or sea salt in the water, preferably at least a day before you use it. Don't over salt the cheese, as this may cause some inferior cheeses to break down somewhat. http://www.mozzny.com/ - Pretty good but not the best NY has to offer. They shipped them in a cold pack box and they came very fresh. If you don't have a local supplier, this is definitely a viable but expense choice. http://www.mozzco.com/ - I've not tried it, but these guys look very serious about their craft. Even more expensive than the previous one. Another alternative is to make your own cheese. I'm no expert on this, so I'm going to refer you to other internet sources. But I'm going to give a super basic primer. Leeners - I would start here. Cheesemaking.com - this is an easy kit, but missing a few things. Google other recipes. There's a lot to learn. Do not use ultra-pasteurized dairy products. The ultra-pasteurization changes the structure and it won't curdle any more. Unfortunately, some states are allowing companies to remove the term 'ultra' and they are passing off ultra-pasteurized as just pasteurized. So be careful. Start with unhomogenized milk. You probably have to go to a farmers market or dairy for this. It should be about $6-$8 per gallon, which makes about 1 pound or a little more of cheese. When an animal is milked, it comes out as cream and skim and the process of homogenization blends them together. It's like shaking oil and vinegar, but the shake is so fine, it never settles out again. So an alternative to unhomogenized is to use cream and skim together. But most creams have been ultra-pasteurized, so you have to find one that is not. How many water buffalo do you own? Well if you have them, use them, otherwise, find a cow. Water buffalo milk has more fat, so one experiment worth trying is to add more cream to your cow's milk. Citric Acid - the easy way. You measure the acid and blend it in and presto, it's acidic. But if you measure wrong, you are going to be unhappy with it. Note than many measuring spoon sets are not that accurate. 2 of my 1/2 teaspoons don't really equal one of my teaspoons, I discovered. There went 3 hours of my life I'll never get back. If you put in too much it will curdle but never form a ball and be stretchable. I've had the best results (nothing to write home about yet), using only 1.25 teaspoons per gallon of milk, which is much less than most recipes call for. Use a starter culture, just like you do for the dough. The culture eats the milk and make acid. It takes many hours though. Of course, this is the more authentic and flavorful method, but as with all these steps, more work. There are a lot of different cultures that can be used to vary the taste of cheese. Some recipes even just say start with buttermilk or yogurt. But for Mozzarella, the most authentic type is called Thermophilic, but even this seems to be a category and there are several varieties sold under that name. Just like with the yeast, there is a dry instant culture you just toss in and a wet, keep-feeding-it-forever variety. Calcium Chloride - helps to restore the balance between calcium and protein in store bought milk. It may also be needed with fresh milk. I've only seen this in the Leeners recipe. Vegetable or animal. Rennet originally came from the lining of an animal's stomach, but most companies sell vegetable rennet. Once you've added the rennet, the milk curdles in a few minutes - it separates into chunky curdles and water whey. They you have to cut it to strain the whey out of the curds and then heat it by either microwaving it or pouring hot water (or whey) on it. I recommend the hot liquid because it gives more of a continuous heat, rather than the microwave method which has you heat it, then work it, then heat it again, etc. Be careful not to overwork the cheese or take out too much whey. Then you will end up pulling out all the fat and end up with a dry waxy cheese, like a Polly-O consistency. Watch this guy do it. He is starting with store-bought curd. It's a dark murky video, but worth watching. 13- Olive Oil - This is optional. In Naples they will typically put on a good olive oil. Many oils do not stand up well to these high temperatures. 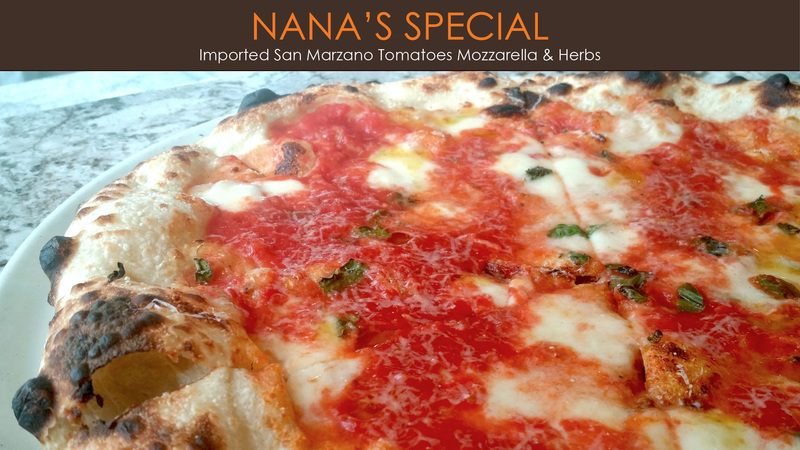 I had one pie at Una Pizza Napoletana in NYC with a very fruity oil from Calabria that was outstanding, even at the high temps. But I don't have the brand. The one's I've tried I can't recommend. 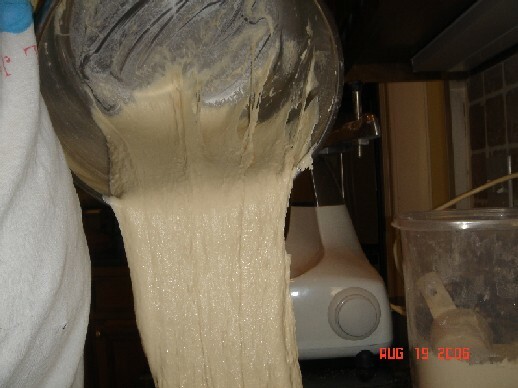 14- Assembly - From the time the sauce hits the dough, the dough is starting to water log. Water logged dough will not rise. This is actually an area that I still need to work on myself. Look at this picture from last night. The rise on the crust is outstanding. but under the sauce the dough has not risen well. In fact it's a bit gummy. The reason is that after I sauced the dough, I took a long time to get it into the oven. Once the sauce touches the dough, the pie should go into the oven seconds later. Have your ingredients laid out so that you can sauce the dough, throw on the other ingredients and get it into the oven immediately. 15- Into the oven for 2-3 minutes. There is a lot of talk about time and temp. Really, time is a better measure than temp. Ovens vary in temp from spot to spot and even 2 stones that have the same surface temp may have a different depth to that heat and that will really play out and affect the time. Ultimately, time is a better measure. 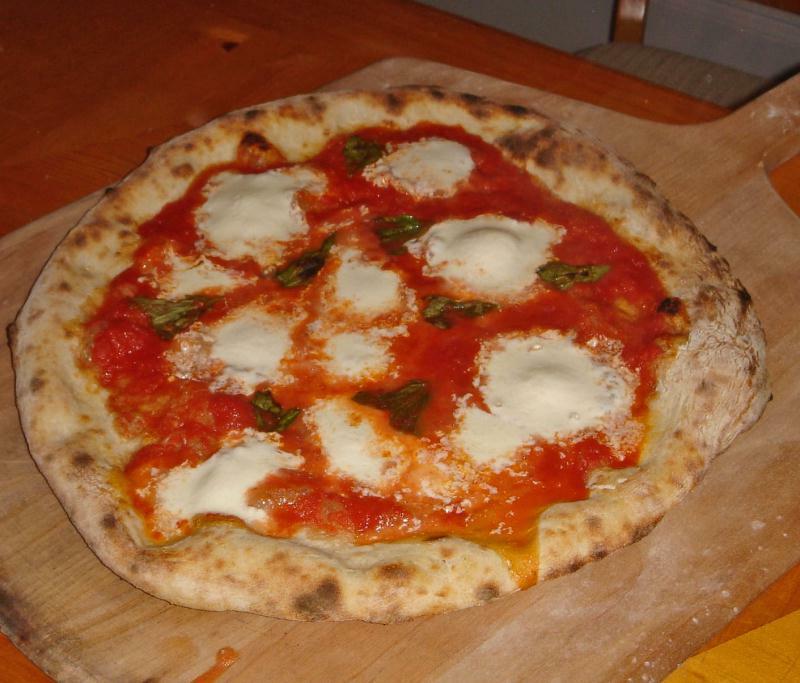 There is a lot of debate online about how long it takes to bake a "true" Neapolitan pie. It started off as 2 minutes, then it went to 90 seconds, then 60, then 45 and recently 30 seconds. Some of this is a "boys and their toys" thing. Instead of arguing about horsepower people are arguing about oven temp. Chill out. 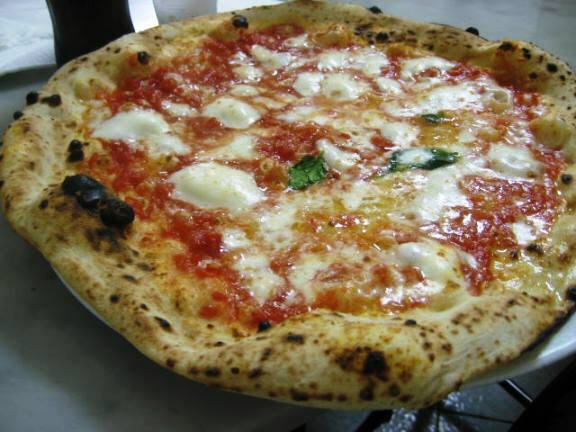 It is true that in Naples, the pies cook very, very fast, usually in under 90 seconds. If your goal is a true reproduction of the Neapolitan style, then you may want to aim for this. But that is not the only style of tasty pizza. A pie that's cooked in 30 seconds is not necessarily better than one cooked in 150. The faster it cooks the less crispy and more airy it is. But this is only good to a point. 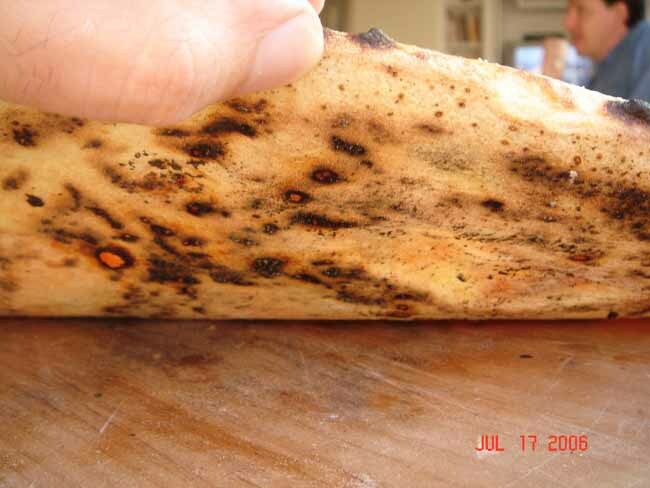 Some dough that are cooked super fast have a burnt bitter outside and are raw inside. It takes a lot of practice to get it all right. Believe me, a 2-3 minute pie is going to be great if you follow these steps. My best pies were 2:10 - 2:30. Maybe it will get even better as I go down in time, but I'm skeptical of the 30 second pies. Patsy's makes a GREAT pie in about 4 minutes. Sally's, makes a great pie in 7. I've timed pies at Luzzo's in NYC at 1:55 and at Una Pizza Napoletana at 2:10. These are all notch places with great pies and crust. There's no question that a hot oven is important - you are not going to get a light airy crust with 10 minute pie. But once you are sub-5 minutes, you are easily in the range to make a great tasting pie, provided your dough formulation is correct. 16- Remove from oven with a peel. When a pie cooks at these high temps, you may find that it is soggier than you are used to. 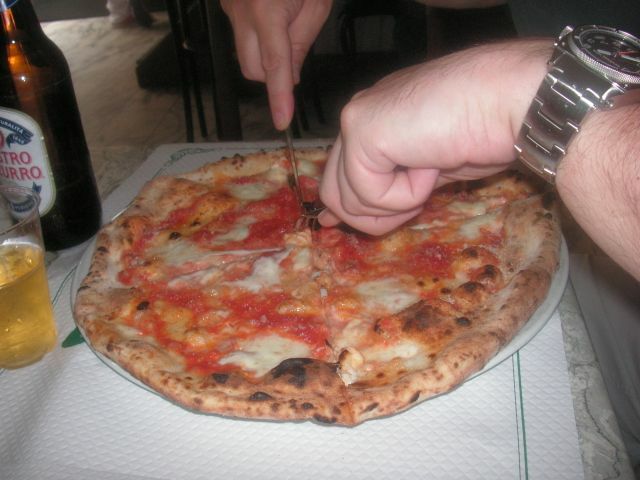 In Naples, the pies are pretty wet and you cut them with a knife and fork and eat them on a plate. There are a few things you can do to lessen the moisture. Use less sauce and drain it well. But also, I put my pies on a rack when they come out so that any steam that is coming out of the bottom can escape. Just a 2-3 minutes on the screen then onto the metal round where they are cut. Don't cut too quickly. The flavors need to settle and they will be more distinct with a cooler pie. If you don't have a rack, you may find it helpful to transfer the pizza back and forth between the peel and the metal round, to allow the steam to escape from the bottom of the pie. Make sure you dry off the metal round between pies so that moisture doesn t build. With High temp pies, there is the possibility of it being a little soggy in the middle especially if you are using a lower protein flour, such as a 00 flour. Brick ovens are very good at sucking moisture out of the dough very quickly. The environment is very, very dry. One downside of an electric, even one at 800F, is that the moisture tends to pool. 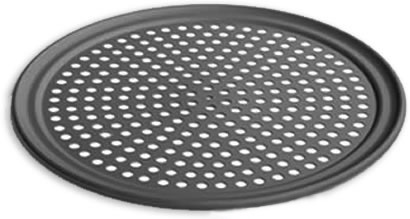 One easy solution is to remove the pie from the oven and place it on a perforated metal round such as this one. I place this on my stovetop so that the bottom is exposed, allowing moisture to evaporate for about a minute. Then I move to a regular serving round. I've seen several 'modern' brick ovens that are gas fired. Burning gas creates moisture and ruins much of the effect of the brick oven. Brick ovens should burn wood or coal. 17 -Season with oregano, red pepper flakes, black pepper and maybe a drop of olive oil (depending on how wet it already is). Except for a minor malfunction of the fresh mozz, this is a pretty awesome pie. The new cheese instructions given above have since solved this problem. You can see that the dry cheese underneath bubbled and charred a bit. It was good, but I don't use dry cheese anymore. I will cut some cross sections next time to you can see how light the crust is inside. This pie used hand crushed tomatoes which I think are too chunky. Springs right back after squeezing. Notice that the tomatoes were crushed by hand and are chunky. I recommend blending them with an immersion mixer or food processor instead. This pie was awesome. Overall it's probably the best I've ever made. The dough was in the fridge for 6 days. When I took the dough out of the sealed container, it had the aroma of a fine wine. I bet it could have gone another few days without a problem. You can see from the color that I used fresh mozzarella from 2 different batches. Both were excellent though. The cheese breakdown problem has been solved. No dry cheese underneath on this one. This pie was made with KA Sir Lancelot (KASL high gluten flour) rather than my normal KA Bread Flour. The difference was pretty nominal. Flour is important but technique is more critical. The lesson of this pie is that the sauce should be a little thinner in the middle than anywhere else. Can you see it pooling towards the middle. Another lesson of this pie is that I need a better camera. My Sony CyberShot is small and chic, but takes mediocre close-up photos. Next KASL from the same batch. This was an excellent pie all around. It was comparable to the last bread flour batch that rose for 3 days, but not as good as the one that was 6 days old. That one was amazing. This pie was among the first with machine crushed tomatoes, rather than hand crushed. It was a huge improvement. This cross section shows the bread structure. See the holes. They are pretty big and the dough is springy. These cross sections are pretty good. The crust is well defined and high. While the bubbles are big they are not as pronounced as they could be. The likely cause: this dough over rose slightly. The big winner here was the sauce. This was among the first pies with the new sauce technique and it's really an improvement. Same pie on the bottom. Perhaps too charred, but good. This pie was a 6 day cold rise Caputo Pizzeria 00 with 56% hydration. Caputo dough seem to absorb much more flour. I tried a pie with a 3 day cold rise also. I know that everyone is raving about the Caputo. Frankly, I hardly noticed the difference. Nothing wrong with it. But I wouldn't go crazy trying to hunt it down. In the last 4 months, mostly to deal with claims on the net, I've tried KA AP, KA Bread, KASL and now Caputo. I'm right back where I started from. Specialty flour is not a huge factor in this process. It's like when you see people arguing about the relative merits of 2 different tensions pulls on $1,000 tennis rackets, meanwhile they go out and miss the ball by 8 feet. Forget it. Maybe if you are making pies at the 99.8th percentile and you want to move to the 99.9th, then you should be worrying about this. Otherwise, let it go. Work on the BIG 3 factors: high heat, a good sourdough starter and technique (mixing and fermenting). This is where you will move from the 50th percentile to the 99th. Then worry about the relative merits of the type of milling or exact mineral breakdown of sea salt from one bay to the next. As in everything, work on the fundamentals. This pie had excellent bubbles and spring. Another dough from the same batch rose 20 minutes less and was cooked at 725 (vs. 800 for the pie shown) and was dense with few holes. Technique, timing, heat - that's the ball game. Way down the list is the flour. This dough was a 4 day cold rise using a blend of KA Bread, KASL and Caputo. Very wet dough. The big thing here was that I used my Kitchen Aid mixer instead of my DLX. While the DLX is far the superior machine, I now have a lot more experience with technique using a wet-knead. The result: the dough was just as good in the KA as it was with the DLX. The DLX is capable of mixing much larger batches and is easier to use, but for 4 pies or less, and with the wet-knead technique, I can now say that the KA dough is just as good. Both pies were exactly a 2:30 at just over 800F. I've learned that the higher the hydration, the better it stands up to high heat. Dry dough will burn at high heat, but wet dough chars nicely. The cornice is not as well defined as it could have been, but the crust was super soft and tasty. These pies were as close to Patsy's as I've come. These were among my very best. They were amazing. The flavor, the texture, the sauce were incredible. But they were not quite as 'Neapolitan' as some are striving for. These were more NY. Comparing Cheeses. Obtaining fresh Bufala Mozzarella can be difficult. The first pie is with Bufala Mozzarella but it's not as fresh as I'd have liked. The second is with cows milk. You can see that they melt differently. These pies were a blend of Caputo and KA Bread, baked at 840F for exactly 2 minutes each. The charring on both pies was excellent. If you use too much bench flour at these high temps you will find that the residual flour is bitter. But if you use too little you may find it hard to get the pie off the peel, especially since I am using a very wet dough. This takes some practice. If you can't slide the pie off the peel, you may have a mini disaster. 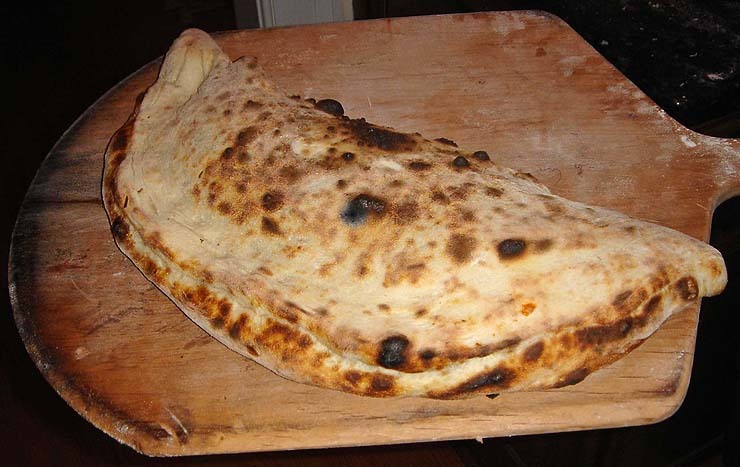 A last resort way to recover is to fold the pie over into a calzone. 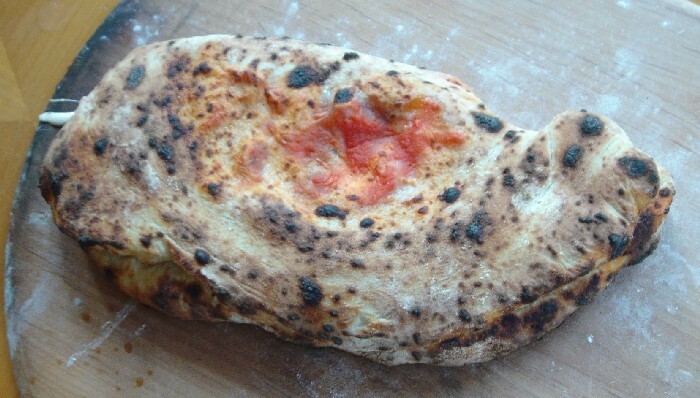 This rustic looking calzone was the result of a trainee who forgot to flour the board at all. But no one complained. It was very tasty. The small amount of sauce on top will keep the top from burning as it puffs up closer to the heating element. I learned this trick from Luzzo's in NYC. If the ingredients inside the calzone are relatively dry (such as ricotta, mozz & ham), then the calzone is best if sealed. If the ingredients are wet, such as with this folded over tomato sauce, mozz pizza, then you may want to pop a small hole in the top to allow the steam to escape. Otherwise you may find the result in water logged inside. This calzone was more planned. It's one of my favorite combinations: Rosemary, sun-dried tomatoes, fresh chopped tomatoes, mozz and pepperoni. This pie was made with regular old White Lily flour you can find in any supermarket. It did behave and feel a little different - it had a heavier, gummier feel when kneading. But once you have experience you can compensate for these things. My guests did not notice the difference and said it tasted the same as the King Arthur. The quality of the ingredients is very important. I have scoured the lands, trying every brand of flour, tomato and cheese I could find. I've had cheese flown in, paying $75 for enough cheese for just one round of pies, I've even made my own cheese from scratch, starting with just milk. I've tasted every brand of tomato I could find and peeled and blanched my own from local tomato growers. And theses things do make a difference. But there's just no getting around the simple truth of 'the big three' - High heat, good natural yeast, and mixing technique. Getting these right will cover a lot of sins and getting these wrong will screw up the best ingredients. Witness the crust on this pie made with cheap old White Lily flour. This pie was very interesting. I made a fresh dough and then took an old dough that had sat in my fridge for about 10 days, and blended them together. This tends to make a very sour - sourdough. Not in a bad way, just very well developed and rich. Typically, if you do this, the dough will not have the lightest structure, but will be a little flatter and chewier. Again, not necessarily bad, but different. Still, some of my guests said this was one of my best ever. Also, I cut the cheese in cubes instead of slices and you can see the effect. It's similar to what Luzzo's did in the very next photo. Finally, this pie had a LOT of extra virgin olive oil on it. 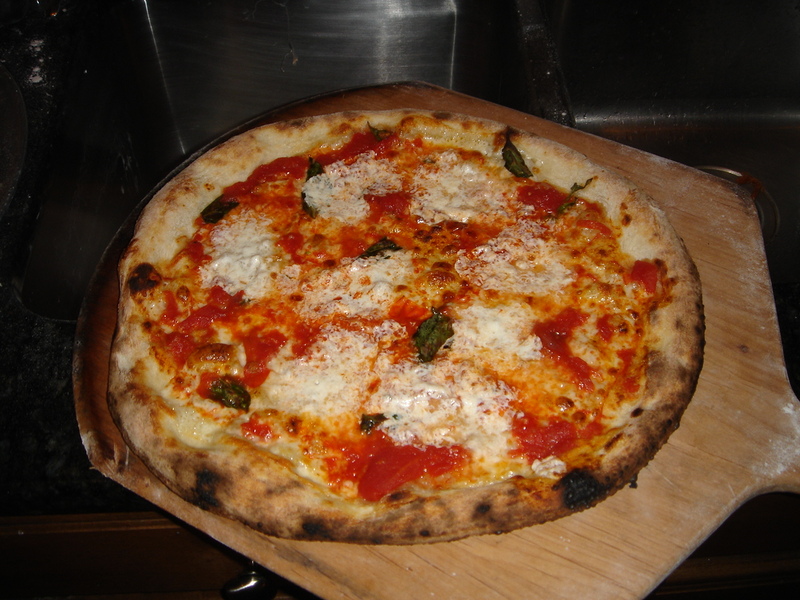 I often put none, but after trying Una Pizza Napoletana's pie, I gave it a try with a lot of oil. I think if I try this again I will go much lower on the sauce to compensate. This pie was also a little lower temp. Probably around a 3:00 or 3:15 pie. This is my Sicilian Pizza, based on my grandmother's style that she made when I was a kid, except with a well fermented sourdough crust. I wish you could have tasted this one. Wow, it was tasty. I made this with a sourdough culture given to me by a fan of this site. 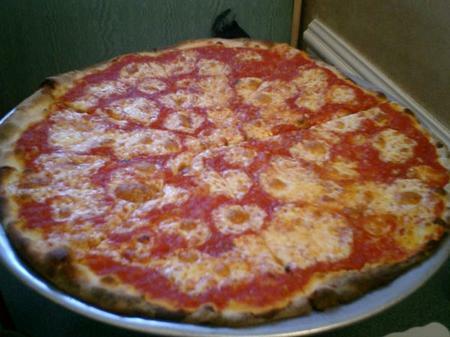 This pie is from Luzzo's on 1st Ave and 12th Street in NYC. Great place. I timed this at 1:55. The taste of the crust was virtually identical to mine. Notice how the cheese was put on in cubes and allowed to melt. 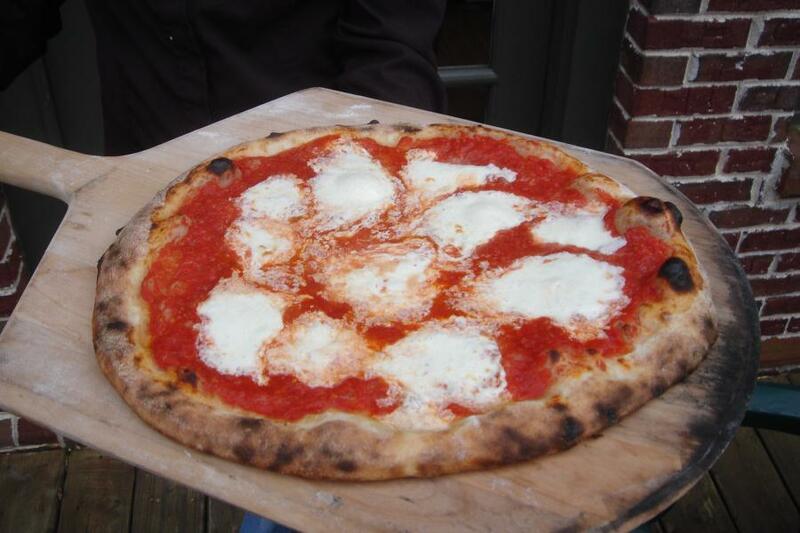 This pie is from Una Pizza Napoletana, just a block from Luzzo's in NYC. Another great place. I timed this at 2:10. The taste of the crust was also very similar to mine, but more mild, less sourdough. It's texture was definitely softer than mine. 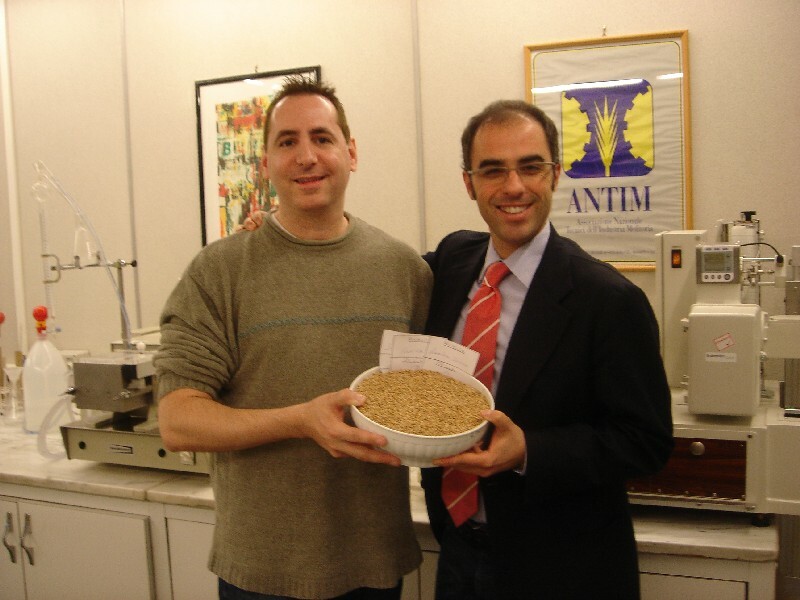 Anthony used all caputo flour, but also uses other 00 flours at times. This pie uses fresh Bufala Mozzarella which was very wet. You can see how it kind of melts and puddles in the middle. This is not what most are used to, but very common in Naples. The really obvious thing about this pie was that it had very little sauce and a lot of fruity olive oil which held up very well despite the heat. He said it was from Calabria but had no brand since it was provided by a friend who grows there. I prefer more sauce, but the olive taste was very very nice too. 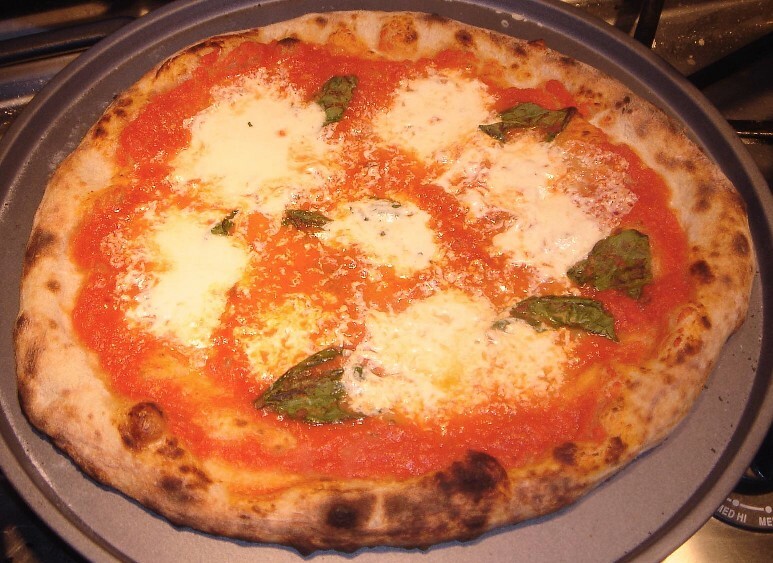 This pie is from Da Michelle, which is considered one of the best in Naples. The is the authentic target. 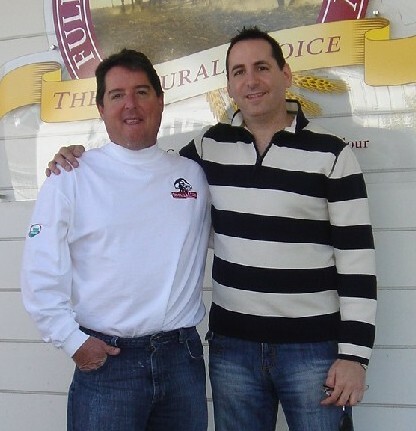 With Ed Levine, guest judge of Iron Chef America and author of the great pizza book, "A Slice of Heaven". Also, the gracious host of this website :-). 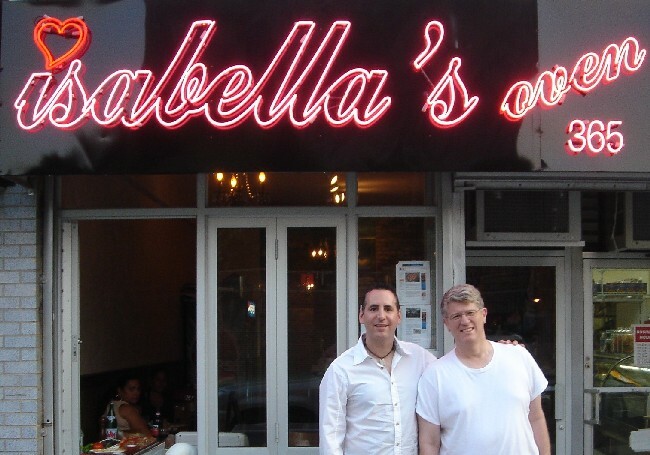 Isabella's Oven is new, but a solid contender. This is me with Evelyne Slomon, pizza historian and judge at the U.S. Pizza Championships. She's perhaps the only person who's actually interviewed the old school NY pizza masters, such as Jerry Pero of Totonno's and knows all their secrets! Johnny's Pizza in Mount Vernon, NY. 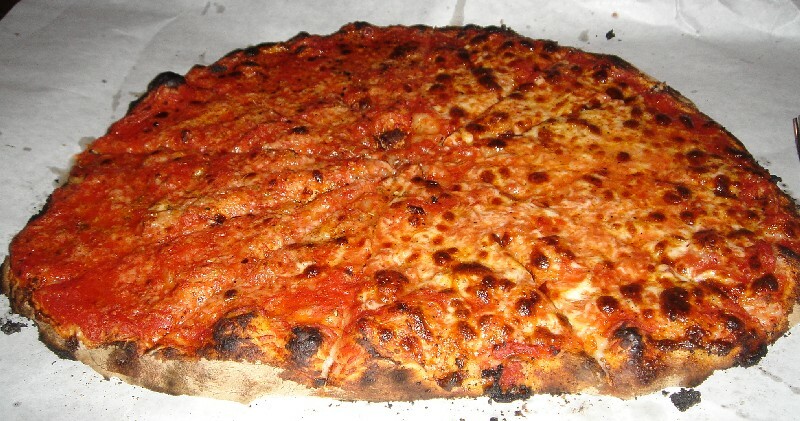 Boy, I'd kill for a slice of this right now... One of the best there is - Probably my all time favorite! Sally's Apizza in New Haven, CT. Aside from NYC, New Haven is probably the best pizza town in the U.S. There are at least 10 pizzerias there that are better than every pizzeria in my home of Atlanta. New Haven sports many styles of pizza, all good, but this is the quintessential "New Haven Style". No other town I've been in makes this kind of pizza. The pie below is half Marinara and half cheese. 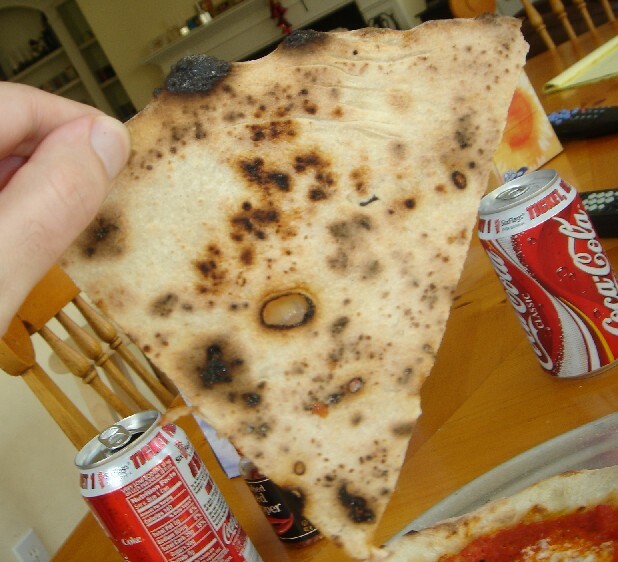 My photo of Modern Apizza, a few miles away, didn't come out that good. But Modern is even better than Sally's in my opinion. Franny's in Brooklyn. An amazing pizza. I created a few training videos for my staff on the styles of pizza. I decided to post these up as is, so pardon me if there are a few references other training materials. 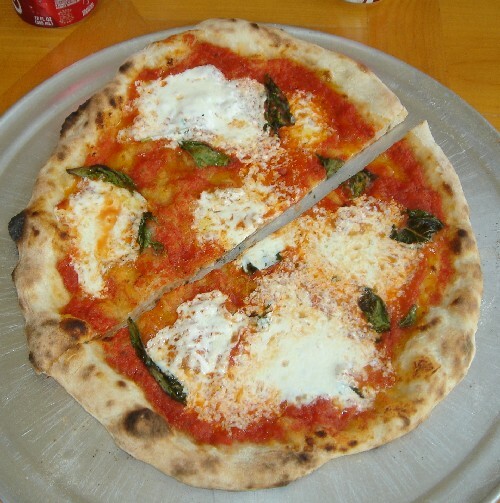 Styles of Pizza found in America - Walks you through about a dozen regional styles. Devolution of Pizza - This explains how pizza went from Naples to NY, then the chains that dominate pizza today. SliceNY has comprehensive listings, photos and reviews of hundreds of restaurants. In this article, I'm primarily interested in highlighting the very best places. Many of the best places are the ones that have stood the test of time. These are the 'old school pizzerias founded from 1905-1955. This article in SliceNY gives a good timeline that shows when some of these places opened. You will see that a good number of today's best places are spin-offs from just a few of the originals. But pizza is undergoing a revival. 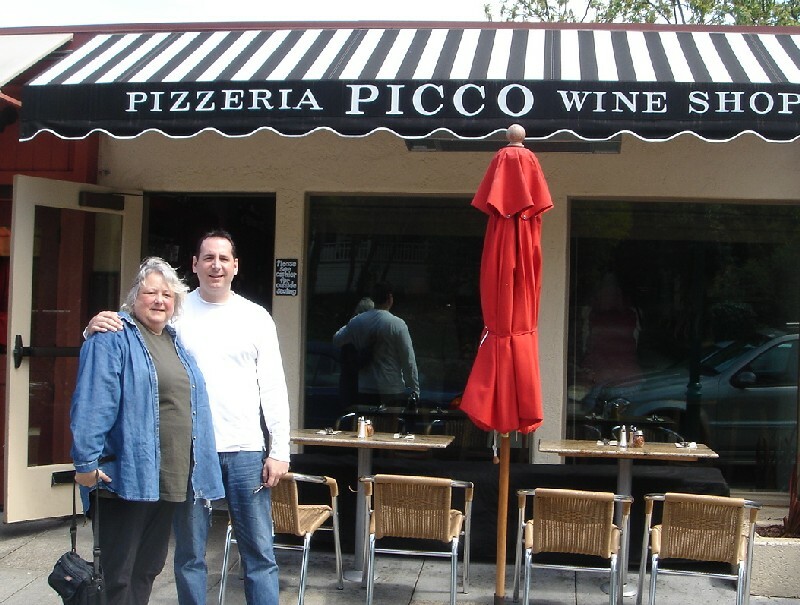 In the last 10 years, especially the last 5, a wave of excellent 'new school' pizzerias have opened. There are a few exceptions, but overwhelmingly the best places are either 'old school' or 'new school' with very few in between. During the 'Lost Years', 1960-1995, about all we got was junk like Domino's, Pizza Hut, CPK, etc. My quest began in 1998 with old school places like Patsy's.. 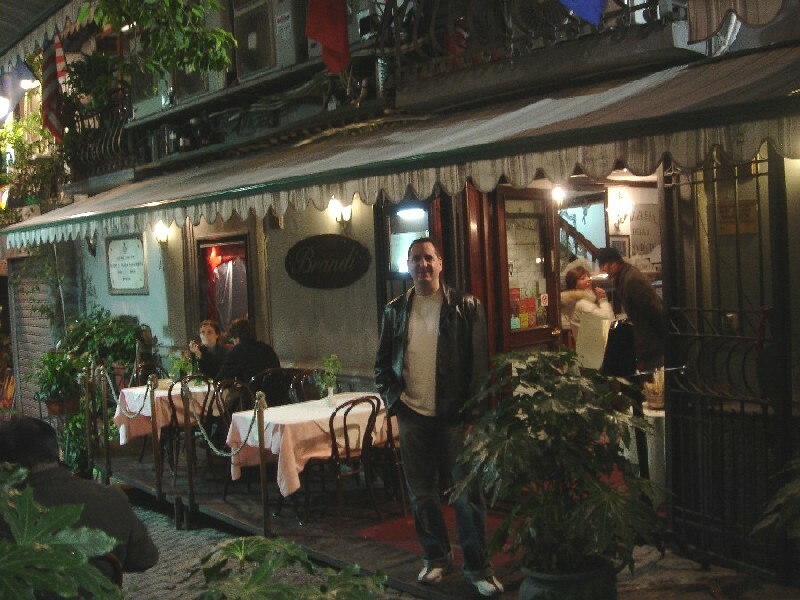 But new places like Luzzo's have quickly risen to the top of a lot of lists. 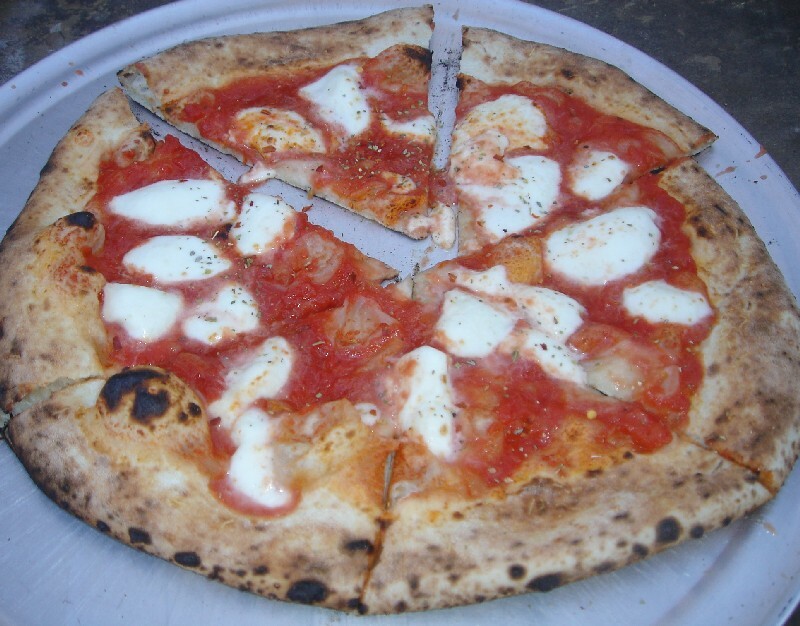 There is an organization called Vera Pizza Napoletana (VPN) that certifies that pizzerias are making authentic Neapolitan pizza. Most of these places prominently post their VPN certification, with one even claiming their certification is "an international award." However, no VPN pizzeria makes it into my top tier and several are among my bottom tier. Basically it's a marketing organization. You pay a few hundred bucks, you take a course and in a few days you are certified and can post a sign up that proves you are a great pizza maker. Yeah right. Personally, the certification means nothing to me. Certainly the best old school pizzerias don't bother with VPN. What makes a good pizza? I don't want to digress too far, but I used to teach a course on the topic of 'Mastery'. It's fascinating to me. There are a lot of similarities to the process of mastering things, regardless of the discipline. Whether it's the violin, karate, golf, finances, cooking - whatever- there are patterns which re-occur over and over. Understanding some of these patterns has definitely helped me improve my pizza tremendously. One pattern that you see is that you have to go through a long period where you learn lots of technique. However true masters have more than technical perfection and often violate 'the rules' of their discipline. Louis Armstrong and Frank Sinatra didn't hit every pitch or beat - they made up their own and it was better. True artistry has soul, not just technical perfection. In the Olympics, judges split the scores for technical merit and artistic impression. I know what they mean - Technically perfect can mean boring and lacking in character. I think that a lot of pizza bloggers are forgetting this. They are looking for technical perfection - how much spring is in the crust, how fast did it cook, how charred was it? I can understand that. But some are starting to sound more and more like wine connoisseurs, lost in the technical, and forgetting the total experience. 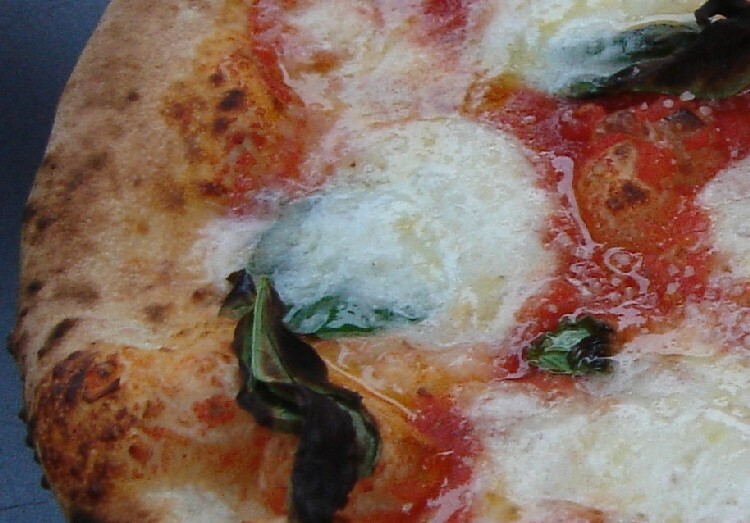 Lots of people are ranking places high if they are "authentically Neapolitan." This is not my standard. Ultimately I really try to rank things on how they taste. Sometimes there's a pie that's technically perfect but yet I would never remember it the next day. It's got all the check marks, but I'd never crave it. 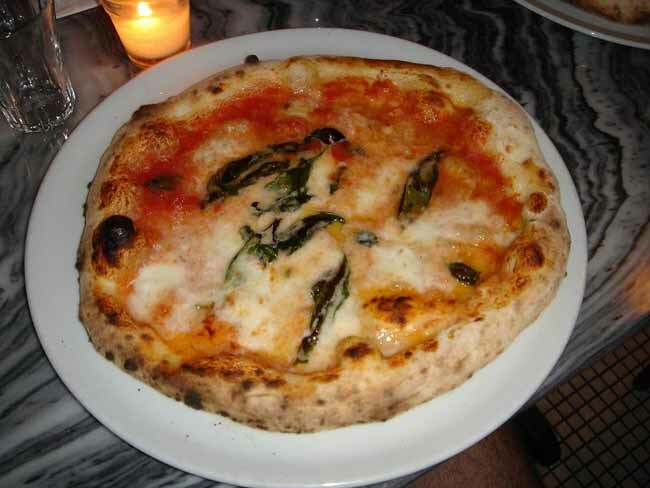 A16 in San Francisco is a good example - very high marks for looking and being an 'authentic' Neapolitan Pizza. But somehow it's just missing something. It has no soul to it. Johnny's, in contrast, may not have the 'oven spring' or other characteristics that many look for, but it's pretty much perfect. I go there looking to have 3 or 4 slices, but usually end up eating a whole pie of 8. No one at A16 is licking the plate like that. Tier 1 - These are the places that I highly recommend. These are worth the drive or even the flight. Tier 2 - These are places that have a good reputation and have very good pizza but I can't quite recommend going out of your way for them. If you are in the area and are going on a pizza tour, you may want to include them. Technically, a lot of these places are good, but again, they are missing something. You can see my rankings for these places dip down into the 4's. I'm grading on a curve and with so many places to rank it was hard to space them. In Atlanta, these places would get 9's and Atlanta's current 'best' would be a 2.
Notable - I've decided not to rank these. I list them but I don't give a number. Some of these places (Ben's for example) used to be great but now ride on their reputations only. Some are notable but not great. Take for Example, GoodFella's on Staten Island. It's the original unit that spawned the GoodFella's chain. I wanted to list it because a zillion people have told me to check it out and if you are a pizza nut like me you may want to pop in someday. But what can I really say about it. I can't really give it a number because it's really just an average NY pizza. I could walk through Brooklyn and pop into a random pizzeria and it's 50/50 that it may be better than GoodFella's. So short of listing every pizzeria in NY and ranking all of them, it's hard to rank GoodFella's. Yet it does get some buzz so I wanted to list it. 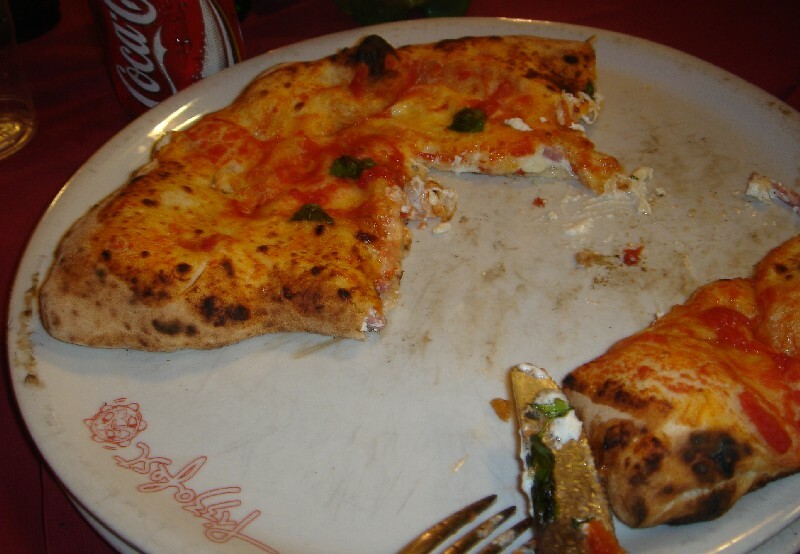 Naples Pizzeria - I really really struggled with how to rank the pizzerias that I visited in Naples, Italy. I had 21 in all. I list the 10 that are well know below. The rest were mostly street pizzas. I decided in the end to list the Neapolitan Pizzerias separately. They are ranked in order with the best one, Gino Sorbillo at the top. However, the spread between the best and the worst was very tight. They were all remarkably similar and utterly unlike any American pizzeria. A few American places, like Zero Otto Nove, A Mano and Franny's are close in style, but given how consistent the real Neapolitan places were, it would be a mistake to put any of the American places in with them. 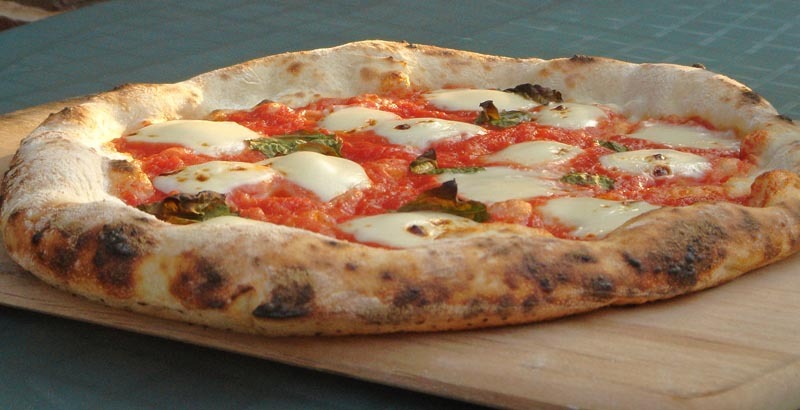 The Neapolitan pizza is a definite style. When I returned I wrote up a 10 page report for a few friends on what I liked and didn't like about the style. I won't bore you with all of that. I'll just say this: it's an acquired taste. Most Americans would not fall down and say "oh this is the best pizza I ever had". At the same time, I now understand the snobbery of some of my Italian friends who say that what we make here is "not really pizza". We are world's apart. The pizzas cook very fast in Naples. They really do cook in 45-60 seconds. This makes them very, very soft and doughy. They are also very wet and don't hold up well when you pick them up. But they are fresher and more about an expression of the ingredients, which is the Italian way. Overall, for my personal taste, I like the top end NY and New Haven places best. Compared to most pizza in the U.S., even compared to regular NY street slices, these high end NY places have a lot of Neapolitan influence. But they bring their own character to the table too. Fake Pizza - I've traveled around and visited lots of places that have been recommended to me or that make it high on Zagat or CitySearch.com lists, etc. I don't want to be insulting, but it's pretty clear to me that those recommending many of these places have never had real pizza. The locals have no reference. For example Atlanta.CitySearch.com used to give number rankings and Domino's scored 9.3 out of 10.... What can I even say about that? Obviously, I have high standards and I couldn't begin to list all the places that don't measure up.. I don't mind bad pizza that much; what I hate is when places pretend to be great and then serve junk. For example, I don't eat a lot of Pizza Hut or Domino's but at least those places are more or less honest about what they are. Domino's claims to get a pizza to you fast and they deliver on that. Papa John's, in contrast, runs countless advertisements with their slogan "Better Ingredients, Better Pizza". Frankly, that just pisses me off. They are just a bunch of liars. Once you get out of the northeast pizza gets a little weird. Pizza and tie dye. Hmmmm... Let me give you a scenarios that plays itself out countless times. You're traveling outside the northeast and you check the Zagat and go into the #1 pizza place in town. It's a trendy new place with a Woodstone brick oven (big time red flag). It's got a full menu of pizza's but usually other items as well. It's usually highly focused on 'gourmet' toppings and the menu may describe their high quality ingredients. "We make our dough fresh everyday" is one of my favorite claims because it shows they don't even know the value of fermenting their dough. They may have a blurb on the menu claiming the chef is from NY or Italy. They talk about their dedication to making great pizza or touting their reviews. Often there's a reviewer claiming that this new place is "better than when I was in Italy" or something like that. They've got a Margherita pizza with "Buffalo Mozzarella" (instead of Mozzarella di Bufala). Then the pizza comes out and basically is no better than frozen pizza from the supermarket. The "Buffalo Mozzarella" is cow's milk (they think that mozz in the water is what makes it Buffalo), the basil is sprinkled on top in a chiffonade (yippee, someone took a cooking class), the sauce is brown and garlicky and the crust is flat, tasteless cardboard covered with cornmeal or brushed with oil. Seriously, any corner in NY is going to have a better slice than this. I would 100% rather eat an English Muffin pizza than one of these. I'm not being facetious. Usually the patrons split a pizza and some fried calamari and then move on to other entrees and can't even remember the pizza 5 minutes later. It's just weird and horrible. And it's repeated over and over and over. NYC has almost 2000 pizzerias. The top places in many cities would be in the bottom 300 in NYC. The single most common email I get is "You think the pizza is bad in Atlanta, you should come here to [Town X]." I could go on a rant naming names but I think I started to piss people off, LOL. I removed the list of these because I'm not trying to create bad karma. I just wish for a couple of simple things. First I want good pizza. Second, if you can't make good pizza, stop claiming that you are gourmet. It's the most overused word in the biz. The only positive that's come out of these places is that they are so bad, they started me on my quest to make my own. So they spawned this website. Meanwhile, back in NYC... NY is not only ahead of the world, it's pulling farther and farther ahead. New Entrants like Zero Otto Nove are solid performers. To help you on your tour, I've now plotted all my favorite places on this color coded Google Map. 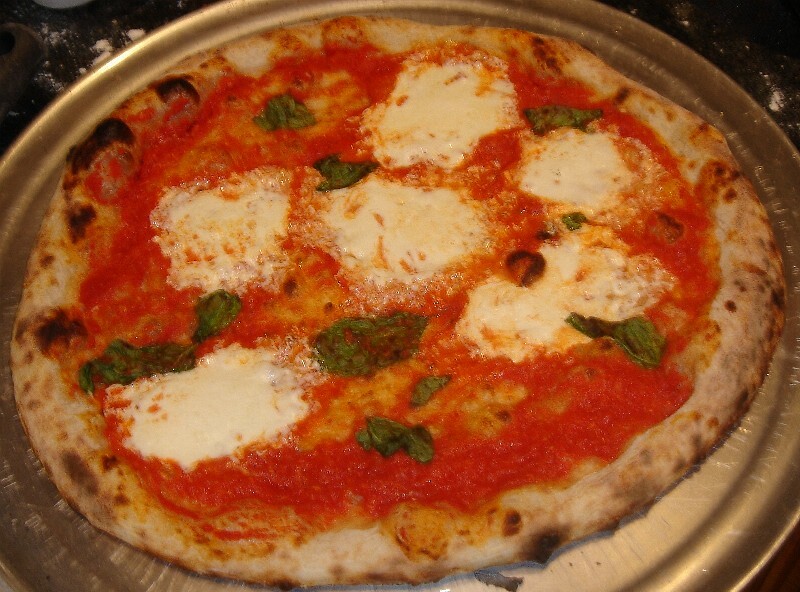 These include Tier 1 & Tier 2, the Naples Pizzerias and also the ones I haven't been to yet. The others may not be worth a special trip so I left them off. Where you are choosing between many, places with a dot in the middle of the map tag are better bets. Use the Mouse Wheel to point and zoom into the city that interests you. In a future version, each pizzeria will have a blog page where you can post your review. 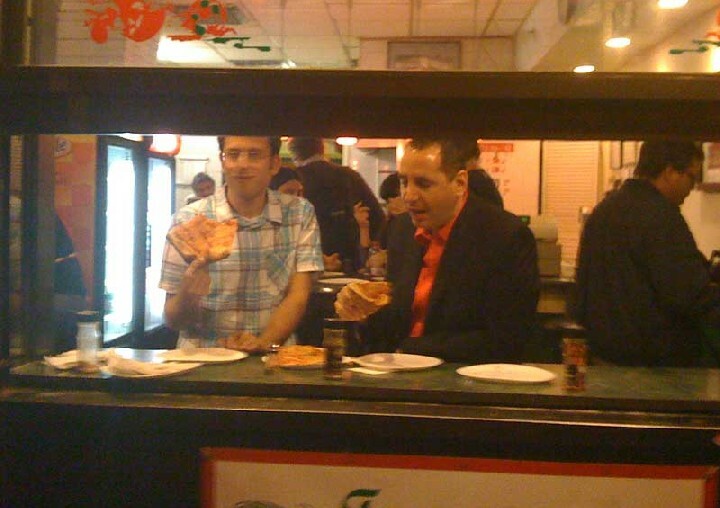 If you are in NYC, let me recommend that you take Scott's Pizza Tour. I met with Scott and he's a really passionate and knowledgeable guy. I may even appear as a 'guest expert' someday on one of his tours. Not that he needs it. He can talk up a storm about pizza and he makes the tour a lot of fun! I talk about this place above. It's very non-standard, but deserves it's ranking at the top. Closed Sunday, Monday and whenever they feel like it. This place easily has the WORST service of any restaurant you are likely to visit. They don't like their customers and it shows. But it's probably the most consistent place on the list. Crispy and NOT for those looking for Neapolitan style. But it's the kind you can't put down and will crave forever. Not as good as Patsy's was in it's prime, but probably the best Neapolitan style currently in NY. Wow, I had some die hards tell me Modern was even better than Sally's or Pepe's, but I didn't believe it. But they are right. It was outstanding. All three New Haven Places are a similar Style, very different than mine, but really good. I had to get in here somewhere. I've been moving up steadily. On a good day I may be even higher than this. 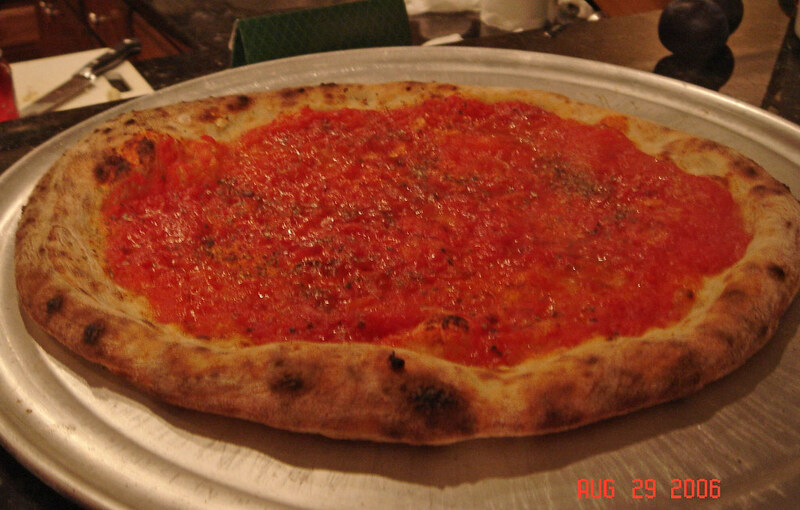 For example, my New Haven clam pie is better than Sally's and my sauce usually better than Una Pizza Napoletana. 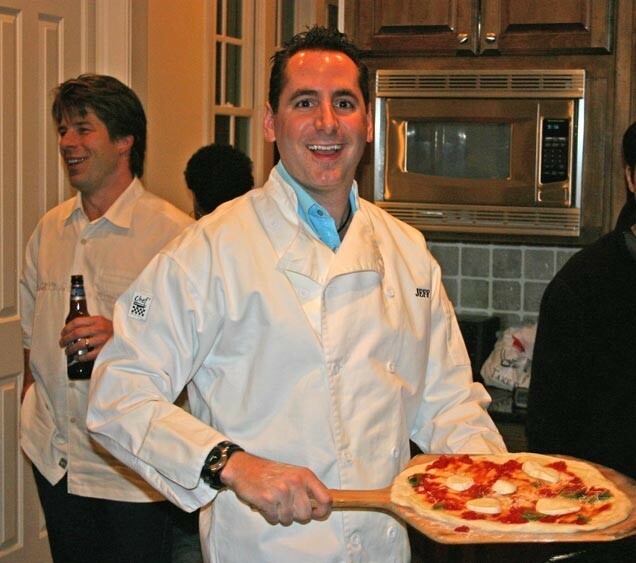 Many who have tried have said I'm better than Luzzo's and even Bianco's. I'm creeping up on #1 :-). The key to my ranking is that my crust is more flavorful than almost any other. Plus I have a secret sauce I don't publish (sorry). Johnny's still blows me out though. This listing is for my home, not for Varasano's Pizzeria. It's hard to be objective about the business and I've been told never to rank it here. But I haven't decided yet. As of today (May 6, 2009, open 6 weeks), I'd say that the pizza is at about 70% of where I want it to be. A good pie would be tier 1, but some of the pies coming out are clearly not near that. All the top places,especially those baking under 3 minutes, have consistency issues. Now that I'm in the biz, I can see why. But we are working hard every day to get better and more consistent. Lots of training and experiments... You'll have to decide for yourself, but if you've read down this far you know that I'm serious about delivering the best. Listed on Food Network as #1 in the U.S. Spin-off from Pepe's. The service is super, super slow, but the pizza is yummy. This used to be a 10 - the gold standard. The single best pie I ever had was from Patsy's. But it has fallen off a lot and may drop further. If you get a great pie, it's still one of the best in town. I recommend ordering a well done, fresh mozzarella Pie. But try a slice with the regular mozz too. May 2007: I just had a pie there that would put this back in the #1 position, but it's so hit and miss I can't guarantee you'll get that on your visit. 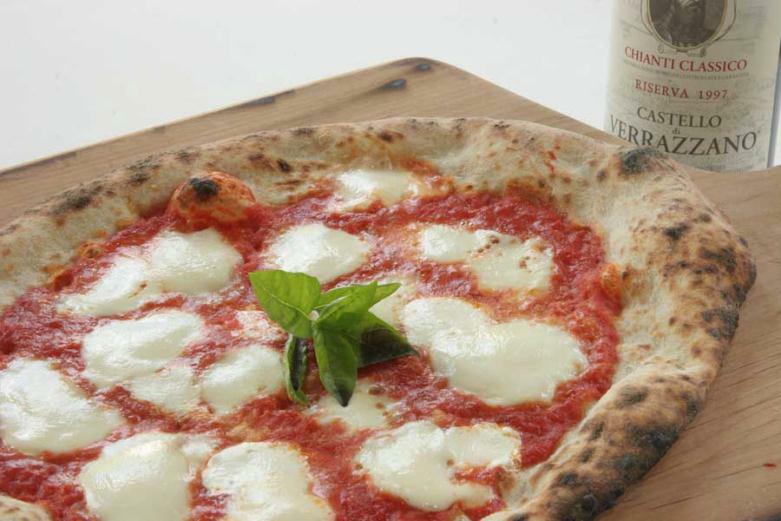 Very true to the Neapolitan Standard, except the sauce is a little more balanced. However the second time I went it wasn't as good. But my 3rd trip in July 2008 trip was excellent. Manhattan Location is Terrible. Westchester Location is pretty good. Spin-off from Lombardi's. Clam pie Amazing. Tomato Cheese very good too. LOTS of people have emailed me that this place had slipped way down. I popped in several times in the past few years and it didn’t even look that good. But Wow! My last visit was a huge comeback. It looked great, tasted great. The big surprise of the trip. This Video gives you some flavor of New Haven Pizza. Get the Clam pie here, then go to Modern for the chesse pie. Get the Sicilian Slice, it's the best around. Really good for both Sicilian and regular. A great 'everyday slice'. Some may say I've put this too high, but I love it. Outstanding. It reminded me a lot of Modern or Louie & Ernies. A little crunchy. Bursting with Flavor. By far the best of Staten Island. Standard 'Street Slice', just better than most. Doesn't look like much, but has a great flavor. Maybe the best Sausage slice I've had. 1300 Crosby Avenue (Near Waterbury Avenue) Pelham Bay, Bronx. Take the #6 train to Buhre Ave. Crosby Ave starts there. Spin-off from Patsy's. I had this twice in the 1990's and was not impressed but it's better on my last visit and people swear by it. Best walk-in Slice in NYC. It's probably slipped a little and may no longer deserve this ranking, but I kept it in. This was the place that really set me off on my pizza quest. It's the first 'great' pizza I had. I used to drive from LaGuardia directly here when I visited NYC. Sadly this place just closed. Good pizza but didn't have a good business model. I wish them luck in their next venture. 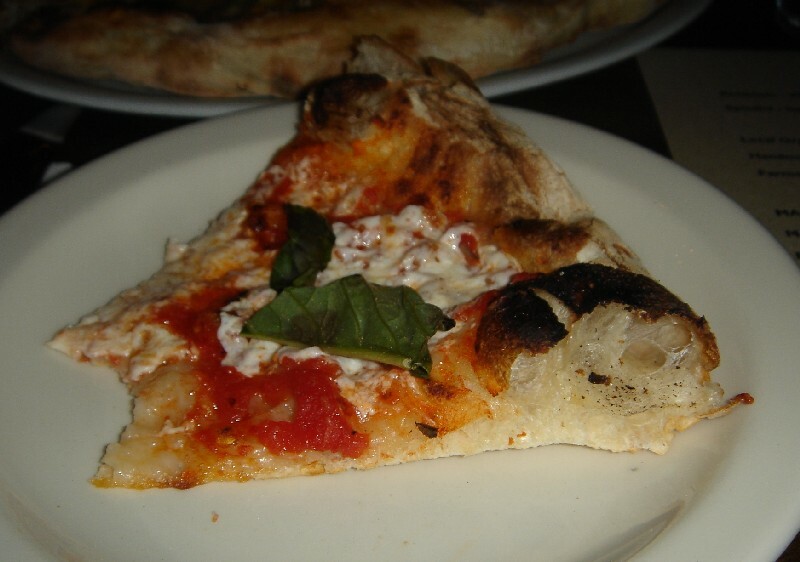 Solid Neapolitan pizza. I liked it better than my guests though. No one has ever heard of this dive bar that happens to make pizza, but my buddy dragged me there and I have to admit it's up there. It almost made Tier 1. Get a sausage pie. This pizza is in the style of Modern, Louie & Ernies and Denino's. In NY, even places that don't know they make great pizza, blow away pizzerias in Atlanta that think they are world class. Run by Evelyne Slomon. Somewhat overly crispy crust, but very flavorful. Not light or Neapolitan, but overall very good. Was great the first time, not so great the next. I probably need to retest this one as this ranking is over 7 years old. Spin-off from Lombardi's. Overrated in Zagat, which often overrates places in popular neighborhoods. 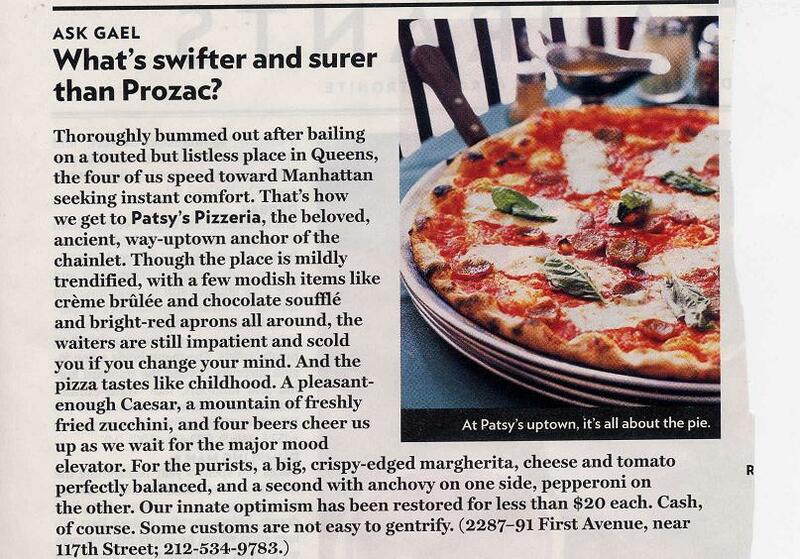 (More people hit John's in Greenwich Village, than Patsy's in Harlem, so this pumps up John's rating). Not great, but still a good pie. First Pizza place in the US. Worth a trip for the history and the atmosphere, but not a great pizza. Kind of a tourist trap. Somewhere in the last few years they TOTALLY redid their recipe. The pie they served 5 years ago bears NO RESEMBLANCE to what they do now. It's actually better now, but don't think what you are eating is what Lombardi served. The history is lost. Interesting Sicilian Style slice. Not super, but pretty tasty. Excellent the first time, not so great the next. Tasty, with a light sweet sauce and nice cheese. But the sauce goes to the edge, so there is really no crust at all. Near Manor Rd. (From Ferry, take 61 bus). Long line and pizza-only menu made me think the pizza would be great. Good, but not great. I had a delivery slice once that was pretty good but when I went in person it was pretty average. Like too many places trying to duplicate the Neapolitan standard exactly, the dough was undercooked and floppy, and also the sauce was too watery and bitter. However, the gelato is the best I've ever had. Pizzaiola Roberto Caporuscio is no longer the owner of this place and it may have just taken a cliff dive. Good try, but not up to the better places on the list. Pizza was too thick and was raw inside. Spin off of DiFara's, but just a shadow of it. Can be great on a good day. Very smokey. Old school and was much better years ago. Tasteless dough and some kind of smoked mozz and cooked sauce. Mario Batali's place. Skip this and go to Batali's Babbo. These are not really pizzas. They are flatbreads. Pretty lame. Nice place, but the pizza just doesn't measure up to all the Brooklyn competition. Good cheese though. Alice Water's famous restaurant started the 'California Cuisine' craze. The pizza was good, but not up to NY standards. Worth the trip but more for the rest of the menu. Tasty brick oven pizza, but flat crust. It's a great place to go to get the classic NY Italian menu, but the pizza was just OK. This is the original unit that spawned the chain. Cool old school atmosphere and not bad pizza, but certainly not going to impress the serious pizza hunter. Huge Disappointment. A lot of people recommended this place and many put it up there with Denino's. I have no idea why. I had both a whole pie and a takeout slice and they were lame. One of the Original Deep Dish Places. I had just a few hours on a layover at O'Hare and got to quickly taxi it out to Malnati's and Giordano's. I like Malnati's a bit better, but honestly, I don't get the Chicago pizza thing. It's ok, but certainly not hard to do and nothing I would remember if it were not for the famous name. It's more like a pizza casserole, than a pizza. Stuffed pizza. But there was so much stuff on it that there's a block of of cheese inside that never even melted. It still had square cut marks. If I wanted to eat a block of cheese, I don't think I'd need to come out to pizzeria. Hmmm... But it was not bad. Just not impressive. Mario Batali's Favorite and the most crowed in town. Beautiful place. Three levels. Don't visit Naples without seeing it. However the pizza didn't blow us away. 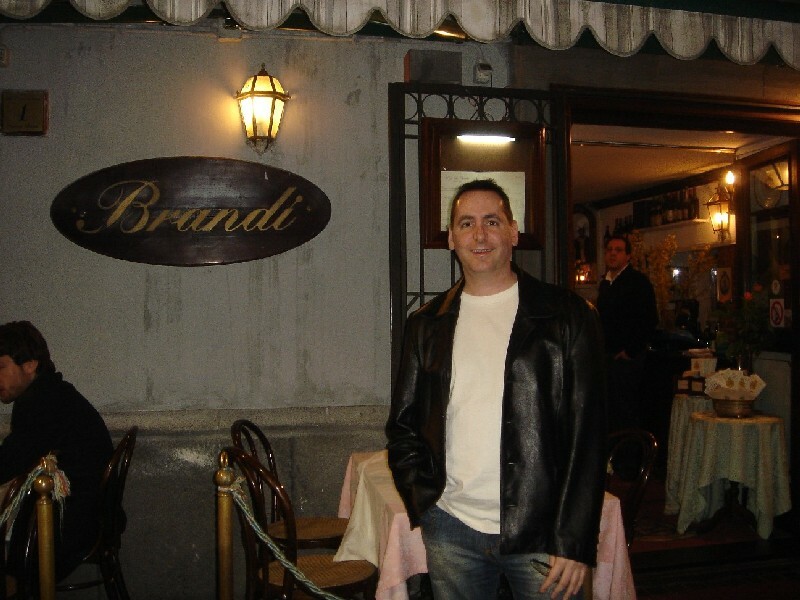 Chris Bianco is a fanatic from the Bronx. Some say it's the best in the USA. Ever since he got the #1 spot in Ed Levine's book and the got on Oprah, the place as a 3 hour line. However four people have had both mine and his and three say that mine is better :-). Of course that's what they say to my face, LOL... I fully expect to put this in Tier 1 when I finally get to try it. Ron Molino's place. Great reputation. Supposedly one of the best. To be Tasted...The place gets rave reviews but some of my friends have said it's overrated. To be Tasted... 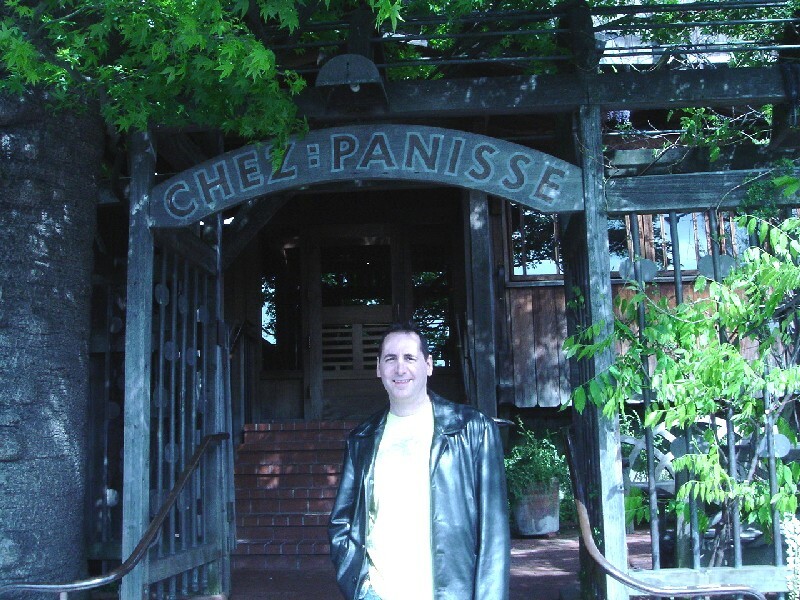 Owned partially by Mario Batali and run by Nancy Silverton of La Brea Bakery fame. It's supposed to be good, but not great. The consensus is that it's good but gets too much press because of it's famous owners. To be Tasted...Brad Sumeri's Place. To be Tasted... But by all accounts much better than Pizzeria Paradiso which gets too much press for pretty lame pizza. Old school (1925), should be pretty good. I can't wait to try this one. Review. My friend scouted this place and said it was very good. I actually walked into this place but through a mix up to complicated to explain, I never got to eat the pizza. Aside from Bianco's in Phoenix, I get more mail about this place than any other west of Chicago. And it's pretty much all positive. The photos look really good to me too. I can't wait to try this one myself. This place gets a fair amount of attention, but my friends who've tried it say it's overrated. New Jersey - Surprisingly, I know almost nothing about NJ pizza.